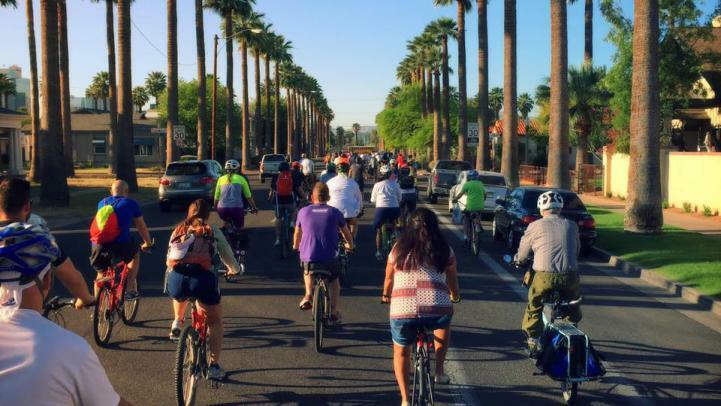 During April, you might notice that Valley Metro and its partners are promoting biking more than ever for improved health, zero pollution, to save on commute costs and to connect with the community. 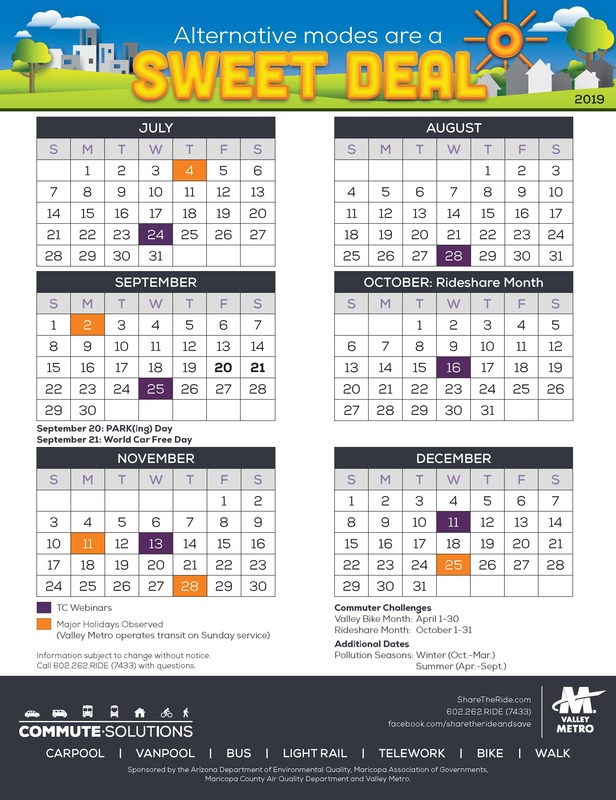 But what about the rest of the year? What about trips to work, school, to grab a few groceries or to the doctor? For many, bicycling – and combining bicycling with other alternative modes of transportation – has become a lifeline. And many now rely on Grid Bikes to make it happen! 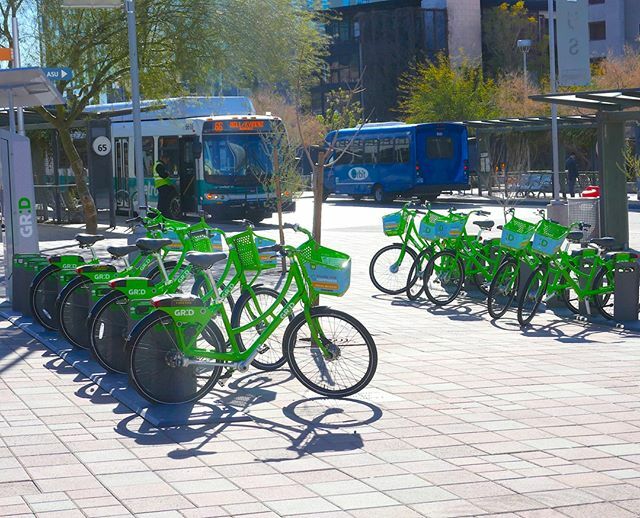 Grid Bikes launched in 2014 and now connects riders in Mesa, Phoenix, Tempe and Scottsdale. Customers provide payment, unlock a bike, ride to their destination and return it to a Grid hub. It really is that easy! The bikes are smart-bikes manufactured by Social Bicycles (SoBi), which sets them apart from other bike-share systems. On the back of the bike is a GPS-enabled, solar-powered panel with an on-board lock. It allows you to put a bike on hold, check it out and return it. If there’s a problem, you can report it and get a different bike. It will even track how many miles you rode and calories you burned by logging into your SoBi account. Besides the handy basket, another favorite feature is the chain-free shaft drive. You won’t have to worry about your clothes getting caught or greasy! There are three speeds, an adjustable seat post, front and rear lights that illuminate automatically, puncture resistant tires and a bell. •	Pay As You Go: $7/hr. Take a look at the network and how many places you can connect! Visit Grid Bikes to learn further details of the program, such as payment options and FAQs. You’ll be on your way to a year-round lifestyle that is healthier and more affordable! April 1, 2019 – TRANSIT SERVICE CHANGES COMING YOUR WAY! There are many positive things about spring in the desert: perfect weather for hiking, biking and playing outdoors; Easter celebrations, weddings and the school year comes to an end for hardworking students, to name a few. But have you thought about transit service changes and how they can improve your lives? Maybe. But I’m guessing probably not. Twice per year, Valley Metro and partner cities update transit service throughout the region based on public input and planning and design projects. 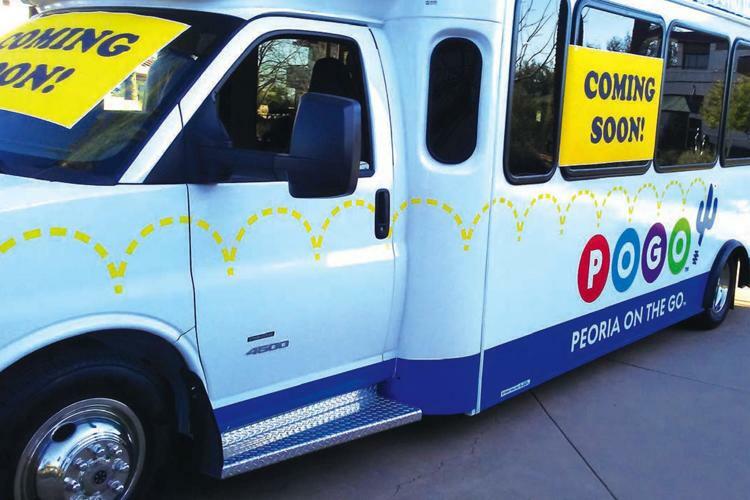 On Monday, April 22, there will be adjustments to bus routes as well as a new circulator, Peoria on the Go (POGO), to serve Peoria. POGO will provide service along the 18-mile route which has retail, restaurants, grocery stores, medical offices and Sunrise Mountain Library. The route also passes two high schools, charter schools and Huntington University. There are approximately 8,000 jobs located within ¼ mile of the route, providing an opportunity to use the bus to access jobs. In addition, the bus starts and ends in the P83 area providing a connection to entertainment and a stop at the New River Trailhead. 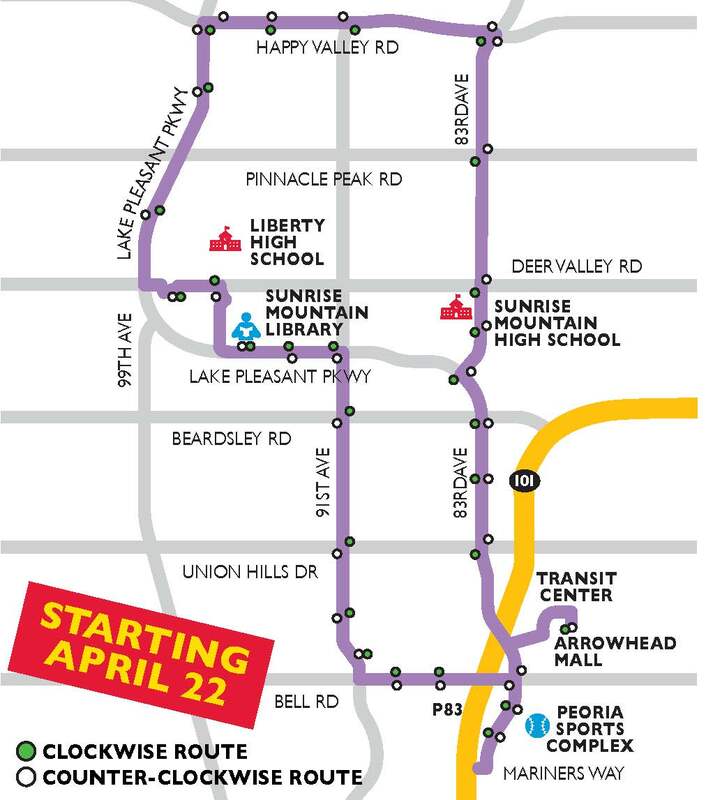 Last but not least, the bus will go to Arrowhead Towne Center with access to multiple bus routes and a connection to locations throughout the region. And did I mention that it’s free? Other exciting changes include Avondale’s ZOOM North and ZOOM South - Sunday service will be added to match Saturday service; in Phoenix, a new light rail station will be added at 50th St/Washington; and on February 25, Fountain Hills opened its first park-and-ride at La Montana Dr. and El Lago Blvd. serving Route 514 – Scottsdale Express. See the full list of changes here and if you haven’t considered taking transit, now is a great time to try it! You can also combine your bus or light rail trip with biking and carpooling to maximize your savings and prevent more pollution! Cheers to a happy and healthy spring! 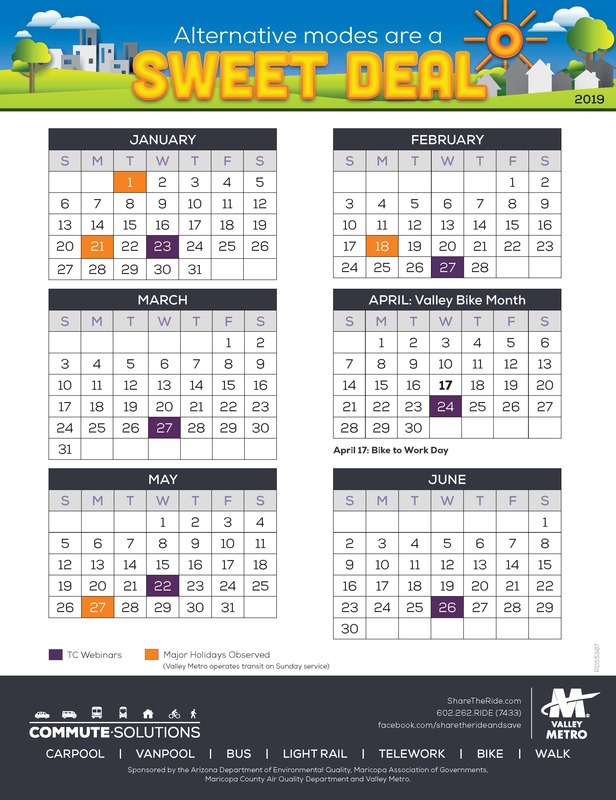 March 18, 2019 – APRIL IS VALLEY BIKE MONTH! Happy spring! We’re headed for Valley Bike Month in April and there’s so much to share! We’re also excited because it’s our chance to get involved with community events that are family-friendly and lots of fun! Or go it alone and still enjoy the health benefits of cycling, chances to win prizes, save money on commute costs and contribute to cleaner air. During March, take the pledge to ride at ShareTheRide.com and you’ll be entered to win one of two $50 REI gift cards. Channel your inner “cycle power” and ride a bike April 1 – 30. Track those bike trips at ShareTheRide.com and you’ll earn points to enter contests. Great prizes are at stake! Join an event hosted by our partners valley-wide. Want to ride with someone who knows the ropes? Find a bike buddy by registering at ShareTheRide.com and select "Find Commuting Partners." Compete with teams of bicyclists valley-wide. Log the most trips in your size category and be entered to win a victory party and limited-edition swag. Register your team by March 22, 2019; members must join by March 31, 2019. Bonus: any team challenge participant who tracks at least four bicycle trips in April can enter to win one of six $25 REI gift cards. Monthly contests - track alternative mode trips and enter to win prizes when you carpool, vanpool, ride the bus or light rail, telework, walk or bike during Valley Bike Month. There are special contests just for bicycle riders. New User Contest - new users who register at ShareTheRide.com and track alternative mode commutes in April will be entered to win one of three $25 Amazon gift cards. Valley Metro is committed to supporting the arts. 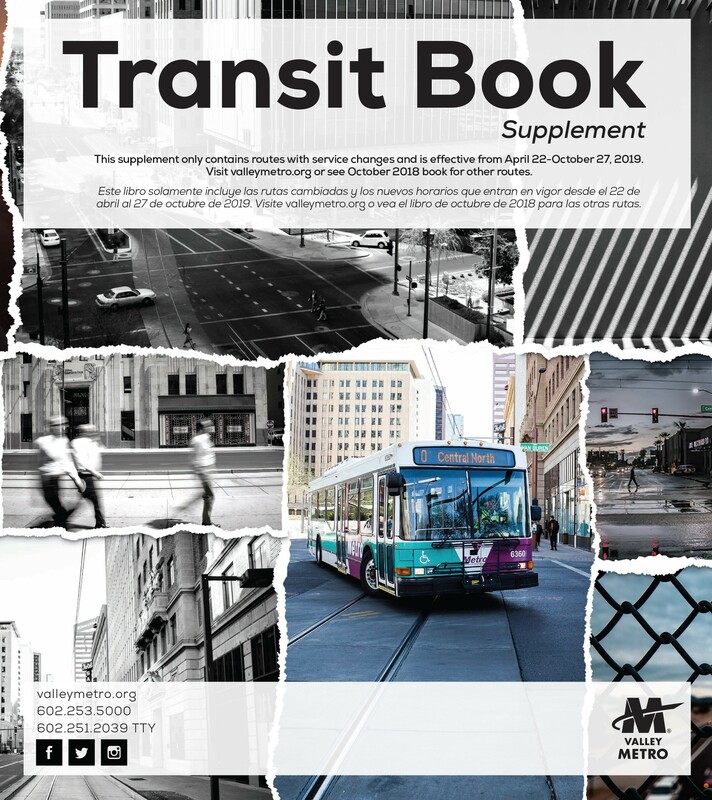 From the Annual Cool Transit STUFF Art Contest and Design a Transit Wrap Contest for high school students, to the ArtsLine program that incorporates local artists and their stunning pieces along the light rail line, we encourage creativity and expression. Valley Metro has hired a local artist to provide this year’s theme. You’ll see the eye-catching image of a cool bike rider against a vibrant orange background. Meet the artist, Lucretia Torva, here. 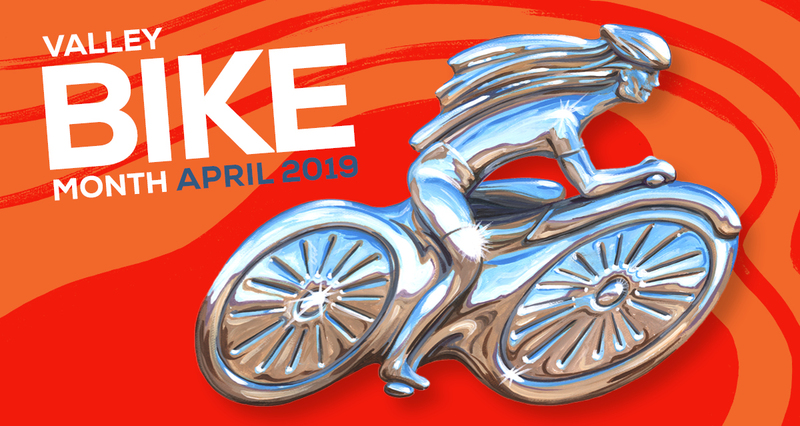 So take the pledge today, review the list of events to attend, find a bike buddy, join a Challenge Team and keep an eye out for a contest on our Facebook page asking friends to comment when they see the image on a light rail train! Happy riding! As part of the Commute Solutions team at Valley Metro, I am often asked by people at business and community events, “What’s new with construction projects?” We have a vast amount of information on our website, social media and in print to keep you updated about projects valley-wide. 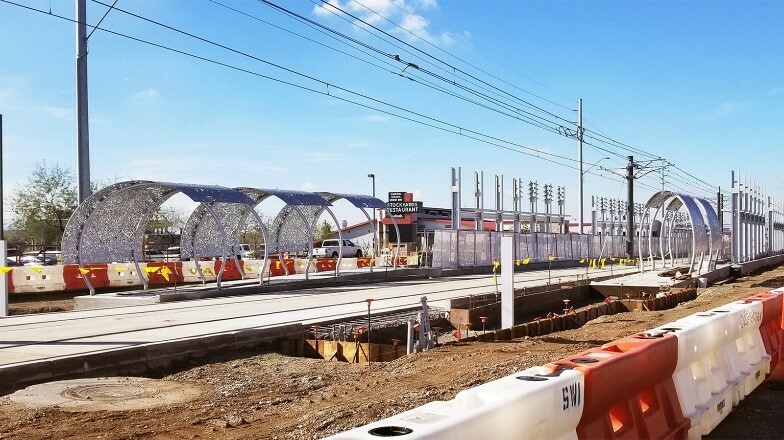 In Phoenix, light rail projects include the 50th Street light rail station - the first new station along the existing Valley Metro Rail system. It will serve the communities and future development near 50th and Washington streets, provide access to the Ability360 facility and neighboring businesses and support transit-oriented development planned for the area. See the Fact Sheet here for a look at the timeline, slated to open in 2019. Phase II of the Northwest Extension is in the planning and design phase. 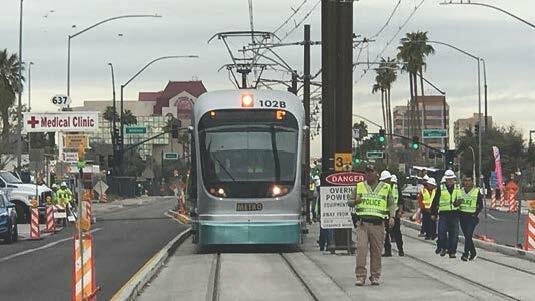 The project will extend light rail west on Dunlap Avenue from 19th Avenue, north on 25th Avenue and across I-17 with a terminus near Metrocenter Mall. See the Fact Sheet here for a look at next steps and project details. A public meeting will be held in spring 2019 to seek input on the project’s design. There is also an internship opportunity: we are now accepting applications for the 2019 Northwest Extension II Summer Internship Program! 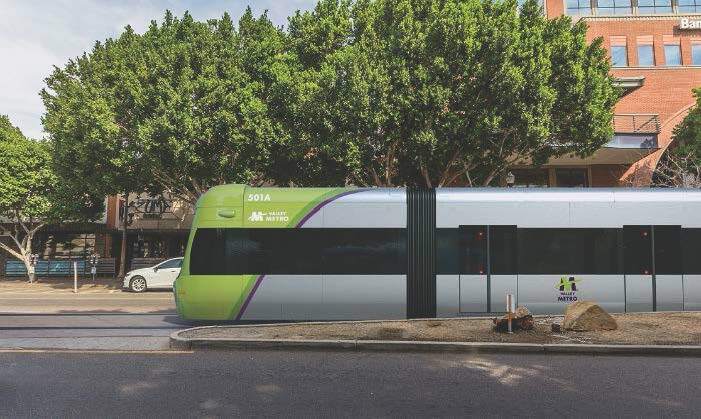 In Mesa, the Gilbert Road Extension will extend light rail on Main Street from Mesa Drive to Gilbert Road, where there are significant transit connections and the ability to serve the growing transit demand in the East Valley. This extension will attract new riders and increase development opportunities. See the Fact Sheet here to learn about the project details, such as the park-and-ride, transit center and roundabout elements. In Tempe, Tempe Streetcar is the first modern streetcar line in the Valley. It will serve one of the highest transit ridership centers in the region and connect riders to neighborhoods, major business centers, and regional events and destinations. 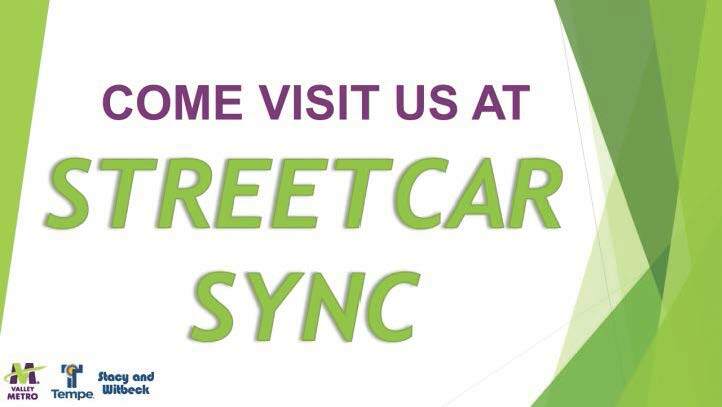 Join us for Streetcar Sync on Thursday, March 7 from 12:00 – 1:00 pm to talk with the project team and get your questions answered about the Tempe Streetcar project. This is a come-and-go event with no formal presentation. The above projects make up only a snapshot of what we’re working on. See all projects, in various phases, here. You can also view the recorded webinar we held in December 2018. We’re busy. We’re excited. And we want to continue connecting communities and enhancing lives. Thanks for coming along for the ride! Now how about a chance to win a special edition t-shirt? Visit our Facebook page and comment on today’s post, letting us know how many years Valley Metro Rail celebrated in December 2018. Hint: We called the celebration Railversary. Good luck – winner will be selected on Friday, March 8! February 18, 2019 – BATTER UP! IT’S TIME FOR SPRING TRAINING! While the majority of the United States is shoveling snow and piling on layers of clothing, folks in the Valley of the Sun are experiencing the meaning of our nickname. Sunshine, blue skies and cool winds make for a perfect outing – particularly a baseball game. Could a daytime outing be any better? Yes, when you remove driving alone and take transit or carpool to the game! Here is a schedule of the 2019 Cactus League baseball games. Use Valley Metro’s trip planner and you’ll see that many Valley Metro buses and light rail serve these stadiums. When you consider the cost of a 1-Day pass, no parking fee or wear and tear on your vehicle, you’ll have enough left over to buy some stadium snacks! If transit is not a good fit for your trip, visit ShareTheRide.com, register for free and search for a carpool partner. Grow your commute trips to include personal trips and save even more money, in addition to work trips. Since 1947, the Arizona Cactus League Association provides a forum to share best practices, to establish and nurture business relationships with respective Major League Baseball franchises and to facilitate and participate in activities to promote and fundraise. The Cactus League industry continues to grow and contributes an estimated $644 million annually in economic impact in the state of Arizona. The Arizona Diamondbacks, Chicago Cubs, Chicago White Sox, Cincinnati Reds, Cleveland Indians, Colorado Rockies, Kansas City Royals, Los Angeles Angels, Los Angeles Dodgers, Milwaukee Brewers, Oakland Athletics, San Diego Padres, San Francisco Giants, Seattle Mariners and the Texas Rangers all call Arizona their spring training home. With 10 facilities hosting 15 teams, the Phoenix metropolitan area has the greatest concentration of professional baseball facilities in the United States. Some facilities offer volunteer opportunities and nonprofit partnerships that generate meaningful contributions to various programs, charities and scholarships throughout the state. Golden sombrero: a four-strikeout performance should be referred to by a bigger hat, such as a sombrero. The term was coined by San Diego Padres player Carmelo Martínez in the 1980s. Sandwich pick: a type of draft pick awarded to Major League Baseball teams for the loss of free agents who meet the minimum requirements by the Elias Rankings. Under the previous collective bargaining agreement, there were three categories of free agents, type A, type B, and type C, or unranked. Wild pitch: is charged against a pitcher when his pitch is too high, too short, or too wide of home plate for the catcher to control with ordinary effort, thereby allowing a baserunner, perhaps even the batter-runner on an uncaught third strike, to advance. 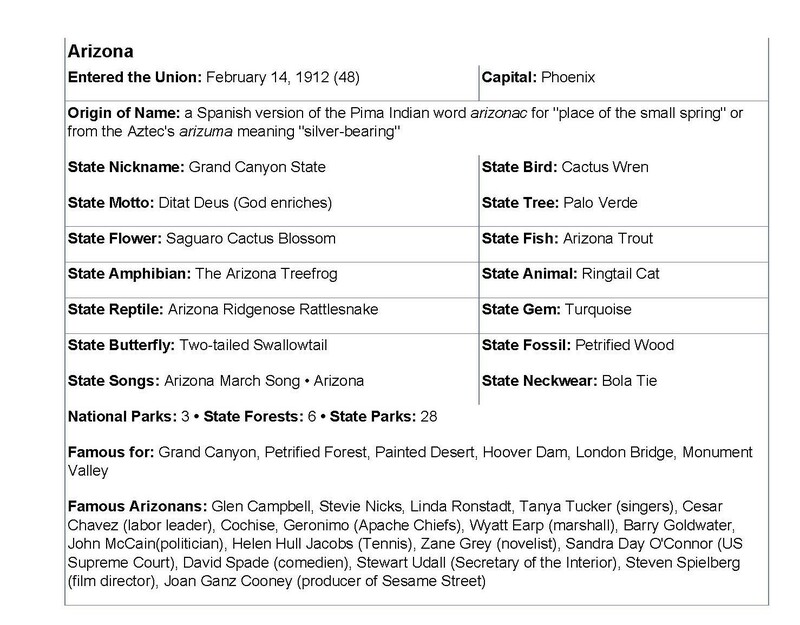 February 4, 2019 – HAPPY BIRTHDAY, ARIZONA! Valentine’s Day is approaching. That may mean a little, a lot or nothing to you. But how about another significant event that occurs on February 14 – Arizona’s birthday? That’s right! On February 14, 1912, Arizona became the 48th state in the union. With a rich history and unique landscapes statewide, Arizona is home to three national parks, six state forests and 28 state parks – not to mention more than seven million people! From Phoenix's founding in 1867 as a farming and ranching community to the early 20th century, the growing town relied on horseback travel and stagecoaches for transportation. A scheduled stagecoach line was implemented along Washington Street in 1887 by businessman Moses Sherman. 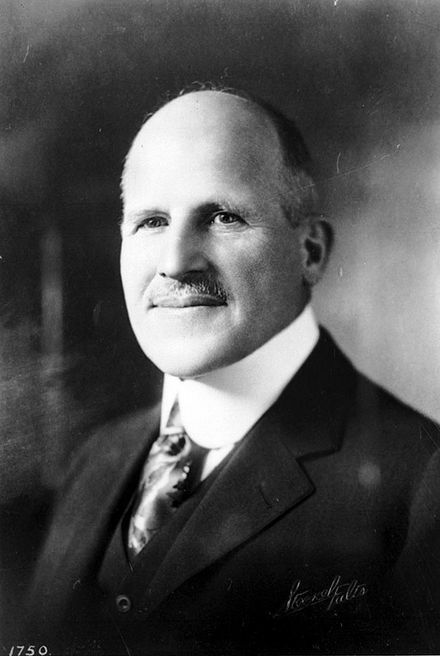 Sherman sold the company and the city expanded both streetcar and bus service. A fire destroyed most of the streetcars in 1947, and the city decided to focus on buses as the means of providing public transit. Photograph of Phoenix Streetcar #116, taken during the grand opening of Valley Metro Rail on December 27, 2008. The streetcar is owned and maintained by the Arizona Street Railway Museum in Phoenix. Phoenix grew into a large city during the automotive era in the early to mid-20th century. The city's initial transportation plan would use "super streets" laid out in a grid plan. When this did not work as planned, the city began building a freeway network during the 1980s. Despite the transportation problems, public transport was not seriously considered to solve the city's traffic problems until the 1990s. In 1985, the Regional Public Transportation Authority (RPTA) was created through a law passed by the Arizona State Legislature. This law enabled the citizens of Maricopa County to vote on a sales-tax increase which would fund regional freeway improvements and create the RPTA. In October of that year, Maricopa County voters approved a half-cent sales tax to fund freeway construction with a portion for regional transit service expansion. A public transit plan was formulated and implemented on March 14, 2000, calling for expansion of the bus system and light rail service. During the mid-1970's Tico first appeared on the front and sides of buses and began his life as the city's transit mascot. In 2004, Maricopa County residents extended the half-cent county sales tax originally authorized in 1985. The tax allocates over one-third of tax revenues ($5.8 billion before inflation) for transit, including light rail. The city has dramatically expanded its public transportation services early in the 21st century, including the opening of Valley Metro Rail in 2008. In August 2015, Phoenix voters passed Proposition 104, increasing the sales tax allocated to transit. It is expected to partially pay for a $31 billion transit plan over 35 years. Under the plan, about half of the new revenue will go to bus service. Wherever you reside in Arizona, there are places, people and things we all can enjoy. Getting to our destination has gotten easier over time. In fact, we just celebrated Valley Metro Rail’s 10th anniversary, or “Railversary”, on December 27, 2018. As a commemorative piece, we partnered with local t-shirt design and manufacturer, State 48, to create an exclusive t-shirt for attendees. How would you like one? Like our Facebook page and simply comment on the February 4th post that mentions this blog is live, letting us know how if you ride light rail. You’ll automatically be entered to win a specially designed t-shirt in either size large or extra large. Winner will be chosen at random on Friday, February 8. Good luck and happy birthday to our beautiful state! Safe and secure. They are feelings that we all want for ourselves, family and friends. It’s no different when taking transit, ridesharing, biking and walking. We have enough to worry about with the demands of life, that we shouldn’t need to worry about arriving at our destination safely. But in the real world, a little vigilance goes a long way. Meet Adrian Ruiz, Director Safety, Security and Quality Assurance at Valley Metro since 2014, and from 2006-2013, was the Transit Enforcement Unit Lieutenant. “Over the last several years, the FTA has taken the FAA model (used by Aviation) and applied some of those best safety practices to light rail.” The Safety, Security and Quality Assurance Division with Valley Metro is working with our state and federal partners to ensure we comply with those safety requirements and meet the expectations of the new applied safety standards. This is a big undertaking for Valley Metro and we are excited about continuing to make transit safe for our passengers,” Adrian explains. Adrian confirms, “We expect this to be the same for bus in the future and we are planning for that currently. More presence on the system is paramount. Everyone from our maintenance staff, cleaners, operators and supervisors, to our security services provider and the ridership are our eyes and ears and their presence lends to an ownership of the system. In fact, passengers now have a great tool - Alert VM - to communicate non-emergencies and to see action." •	Easy. Finding a partner to share the commute is fast and easy on ShareTheRide.com. •	Convenient. Carpoolers and vanpoolers create their own arrangements to best meet their commute needs. •	Saves money. Share the cost of gas and parking. Reduce miles driven to save on insurance and maintenance expense. Federal law may also allow you to pay vanpool fares from pre-tax dollars. Add more people to your vehicle to increase the savings! •	Saves time. Get there faster thanks to quick-moving and less congested High Occupancy Vehicle (HOV) lanes. •	Reduces stress. With someone else behind the wheel you can sleep, read or relax. •	Helps the environment. With fewer cars on the road, emissions of pollution are reduced. Your choice helps reduce traffic and improve Valley air quality. •	Flexible. They are flexible to meet family and work schedule needs. Safety and security are still priorities when taking these alternative modes of transportation. When searching for a commute partner, use ShareTheRide.com so your location is represented by an icon on a map in the general area where you live, as opposed to an address. When you decide to meet your new partner(s), select a public location in a well-lit area. Verify their work information and ask for a reference. Let’s all be vigilant regardless of our travel mode(s). Together we can make our community a safer one! With the holidays behind us, you may be thinking that there isn’t much to celebrate for a while. Think again! On Monday, January 21, Martin Luther King Day will be widely celebrated in the Valley, in addition to events on other dates this month! History.com describes Martin Luther King, Jr. as a social activist and Baptist minister who played a key role in the American civil rights movement from the mid-1950s until his assassination in 1968. King sought equality and human rights for African Americans, the economically disadvantaged and all victims of injustice through peaceful protest. •	The City of Phoenix hosts the MLK Awards Breakfast, the MLK March and Festival, the Community Day of Service, the MLK Youth Celebration, and the MLK Basketball Classic. Venues include The Phoenix Convention Center and is accessible by light rail. •	Tempe celebrates MLK Day with its annual MLK Diversity Awards Breakfast, hosted by the Tempe Human Relations Commission, and the Regional Unity Walk at Tempe Beach Park. Venues include Tempe Beach Park and is accessible by light rail. •	The City of Mesa plays host to three MLK Day events: Breakfast at the Convention Center, the MLK Parade, and the Community Festival. Venues include the Mesa Arts Center and is accessible by light rail and local bus route 40 Apache/Main. •	Scottsdale plays hosts the Scottsdale MLK Dinner and the Peace and Community Day. Venues include Embassy Suites Scottsdale Resort and is accessible by local bus route 72 Scottsdale/Rural. •	The City of Surprise hosts an annual Day of Celebration and Services at Surprise City Hall. For venues not accessible by transit, try registering for free at ShareTheRide.com and search for a carpool. Some of the most famous quotes made by Dr. King provide inspiration, encouragement and wisdom. Which is your favorite? Whether or not you can participate in the celebrations this month, we hope that the mark Dr. King has left will always provide purpose and his teachings will always be in your mental toolbox. Happy Martin Luther King Day! December 17, 2018 – NEW YEAR. NEW GOALS. Right now, you may be hustling through the work day and trying to wrap up projects so you can enjoy some time off to relax and enjoy the holidays. You may be facing a work schedule with no breaks and simply need to move ahead. You may be a student enduring final exams or a stay at home parent whose children who keep you on your toes and want to experience the magic of the season. No matter what the final weeks of this year hold for you, we all have something in common: 2019 is a chance to set and meet new goals. ShareTheRide.com can help you set and meet many goals. Save money, for example. Register for a free account, create your profile and search for a carpool, vanpool or transit route. Once you have found the right fit, you will immediately see the savings because the cost of gas, vehicle maintenance, insurance and parking will decrease. You will also save time. When you carpool or vanpool, you are able to use the HOV lane, cutting your travel time in many cases. How about improving your environmental impact? When you track your alternative mode commutes using the Commuting Cost Calculator at ShareTheRide.com, you will see the greenhouse emission gases prevented. Personal goals may include improving your health. Cleaner air certainly contributes to better health, so sign up for free air quality alerts, which include High Pollution Advisories. When you receive a text or email, you’ll know that it is especially important to leave your car in the garage and instead, carpool, vanpool, take transit or telework. Getting fit is also a popular goal and can be attained and maintained easier with the help of a fitness tracker. Check out these highly-ranked ones when making a buying decision. We would also like to add that writing down your goals is part of the success. 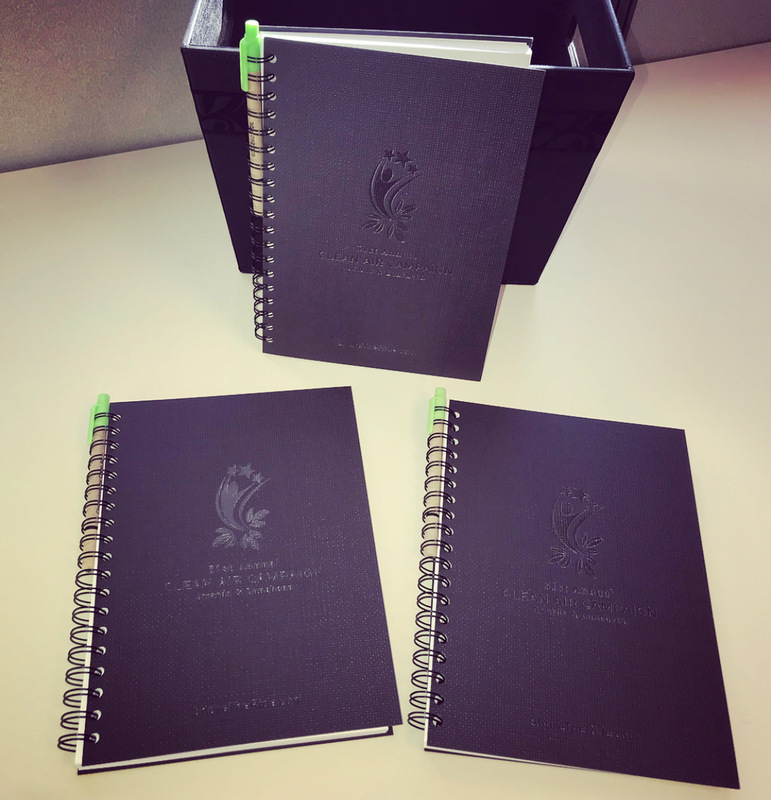 We have a sharp new blank journal/planner for a lucky participant who simply comments on our Facebook post today that our new blog is live. Baby steps. Big steps. A giant leap. No matter what your goal(s) is, we wish you a happy, healthy and successful new year. We also hope to assist in reaching those goals with our tools and resources at ShareTheRide.com. December 3, 2018 – ‘TIS THE SEASON! Is anyone else trying to slow time down, savor the moments with family and friends and enjoy the holidays before they pass us by? One way to make the most of the holiday season is to visit local festive events! And when you consider many are low-cost or free, the stress of spending a lot of money is suddenly lifted off our shoulders. All aboard the Polar Express! 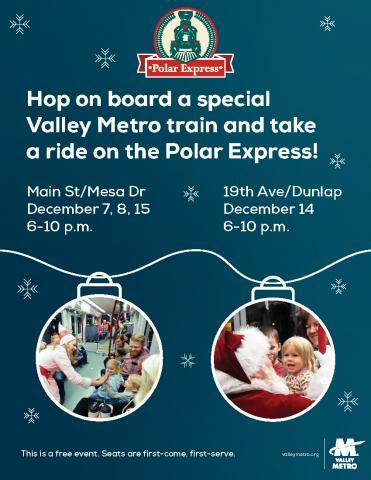 Enjoy a special train ride complete with singing elves, cookies and a visit from Santa. With the success of the event over the years, Polar Express is expanding to Phoenix. Free to attend! 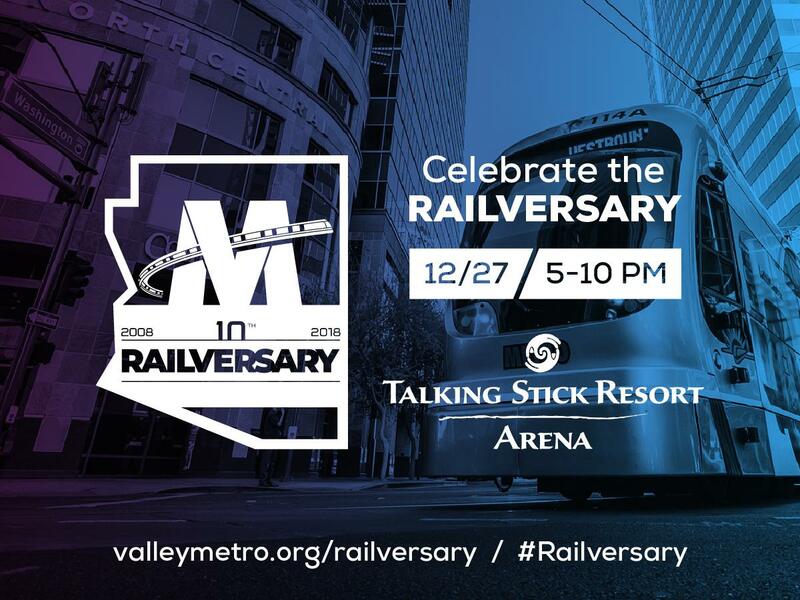 Join Valley Metro to celebrate 10 years of connecting communities and enhancing lives through light rail on Thursday, December 27 at Talking Stick Resort Arena in downtown Phoenix. There will be an art and photography exhibit, music, entertainment, refreshments, giveaways, interactive zones and much more. The Railversary Celebration will serve as the event hub and starting place for the Railversary Ride Experience, a family-friendly event that will take place from 5–10 p.m., featuring a digital scavenger hunt where riders are encouraged to visit local businesses and destinations along the rail through all three cities — Mesa, Tempe and Phoenix. Celebrate the New Year safely! 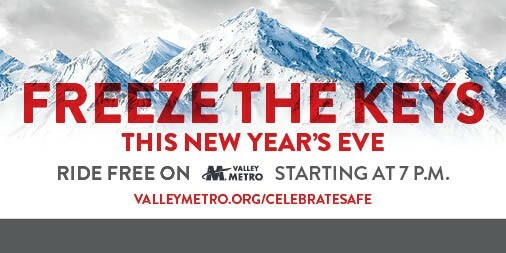 Valley Metro has partnered with Coors Light and Uber again this year to bring free rides on local buses, light rail and paratransit starting at 7:00 p.m. on New Year’s Eve. Uber is offering a discount code CLHOLIDAY18 (valid December 1-January 1 until 10 a.m.) - Get $5 off 2 Uber rides to or from any Valley Metro rail station! Stepping outside the box and want to experience something different? Our friends at The Thirteenth Floor have graciously donated two General Admission passes to Krampus: A Haunted Christmas. The creators of the Fear Farm are continuing a twisted holiday tradition that is sure to fright and delight holiday revelers looking to reimagine the holiday spirit. Terrifying audiences across the nation, Krampus: A Haunted Christmas will open in Phoenix for two days only – Dec. 7 and 8. This experience is sure to provide a break from carol singing and tree trimming, as the spirit – or the ghouls – of Christmas come to life! Visit our Facebook page and comment on the December 3 post about this blog, letting us know what your favorite holiday tradition is. One winner will be chosen on Wednesday, December 5 at random and announced on Thursday, December 6. Need to do some holiday shopping? Valley Metro’s Bus Destination Guide includes shopping malls with transit routes to get there, an affordable way to travel that reduces pollution and traffic congestion! Escape Zone - Arizona's most immersive Escape Room experience! Mention the VIP ticket special and receive a discounted ticket of $20 per person with your Shop On card. Valid 7 days a week for any of our rooms. Come and play! Tempe Boat Rentals - Boat rentals on Tempe Town Lake. 20% off rentals at the Tempe Town Lake location. Lotions and Potions - Specializes in custom scenting with more than 550 fragrance oils. 10% off any purchase of fragrance oils. 25% off bicycle rentals of two or more bicycles and BOGO Flat Attack tube sealant with any tube installation. Get both your tubes sealed for the price of one. You can also print coupons for more businesses here. We wish you a happy and safe holiday season! Enjoy. Every. Minute. Winter Pollution Season began October 1 and the most prominent pollutants are PM-10 and PM-2.5; PM-10 is coarse particulate matter less than 10 micrometers in diameter, generally emitted from sources such as vehicles traveling on unpaved roads, materials handling and crushing and grinding operations, as well as windblown dust. PM-2.5 is fine particulate matter less than 2.5 micrometers in diameter that results from fuel combustion from motor vehicles, power generation and industrial facilities, as well as from residential fireplaces and wood stoves. So you may be thinking, “That’s really bad news if our family wants to have a fire to keep warm and to add to the holiday ambiance when a No Burn Day is issued.” Yes and no. There are alternatives to burning wood. For example, electric fireplaces do not require any installation and they have zero emissions – no smoke! They are the most efficient way to heat a room, reducing energy costs. And there is no need to worry about ashes or large flames around children and pets. •	Fireplace Retrofit Program is a free program to retrofit chimneys with catalytic conversion technology or convert wood burning fireplaces to natural gas. Learn more here. 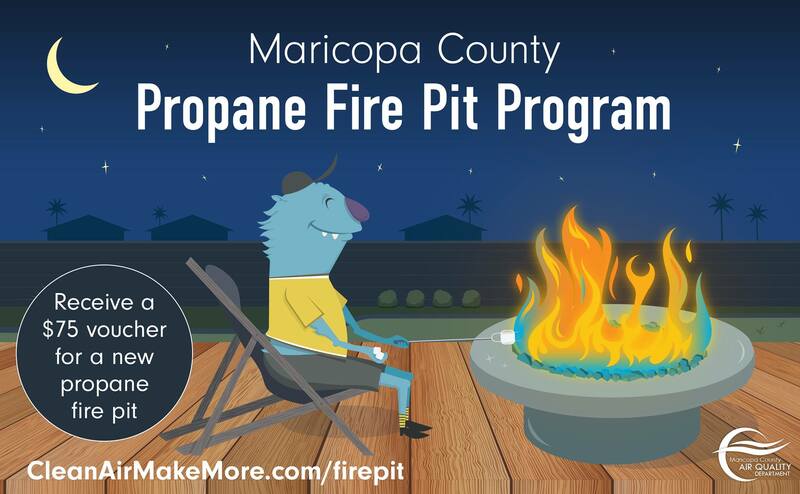 •	Propane Fire Pit Program provides vouchers good for $75 off new propane fire pits purchased at select Home Depot stores. Learn more here. Help protect the health of our loved ones and neighbors and don’t burn wood when it is a No Burn Day. 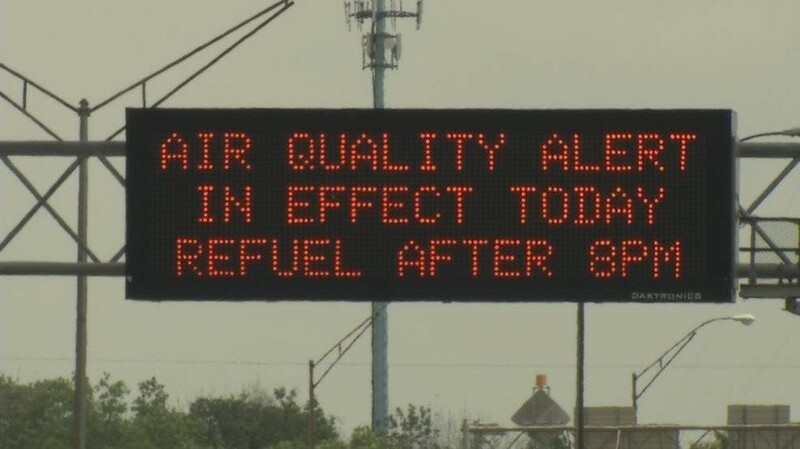 To learn the latest air quality forecast and No Burn Day status, you can download the Clean Air Mobile App, sign up for email or text alerts, visit CleanAirMakeMore.com each day or call 602.506.6400. We wish you a warm, safe and healthy holiday season! November 5, 2018 – CLEAN AIR CAMPAIGN AWARDS & LUNCHEON – WHAT’S THE BIG DEAL? Imagine being tasked with coordinating an event to accommodate nearly 500 people, serve a top-notch meal, provide musical entertainment that will impress all tastes and deliver a thought-provoking speaker, all at a venue that surrounds guests in desert beauty. Done and done. 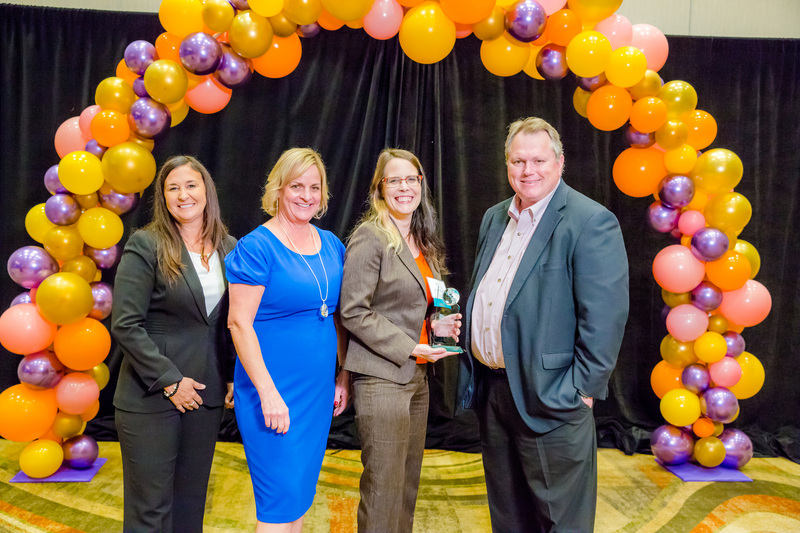 On Tuesday, October 25, Valley Metro held the 31st Annual Clean Air Awards & Luncheon at the JW Marriott Desert Ridge Resort and Spa. 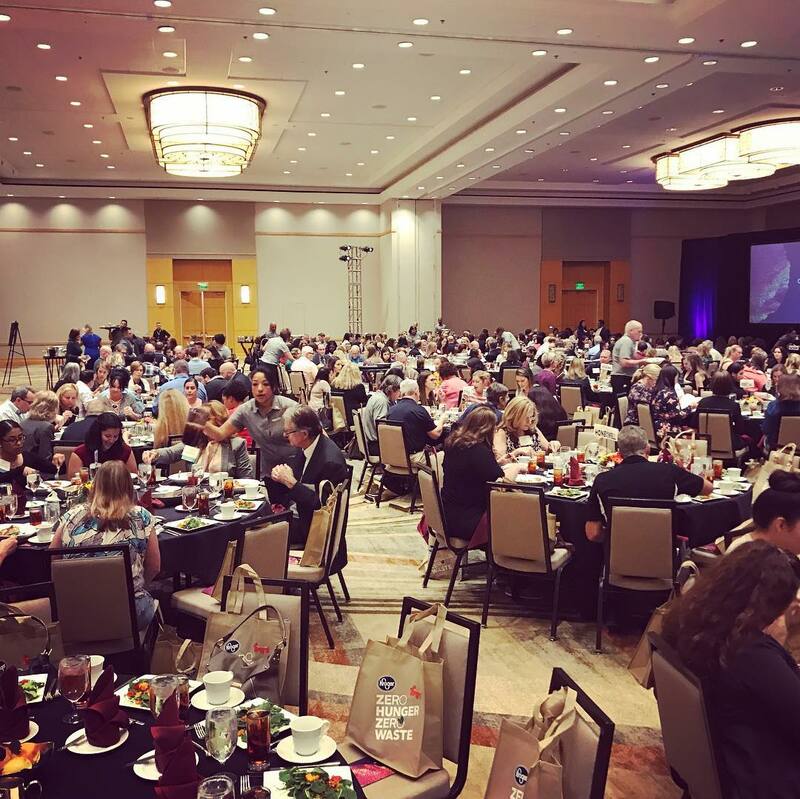 Attendees were treated to a memorable meal, entertainment by Sahnes Music, charming Master of Ceremonies, Amber Sullins of ABC15 News and a keynote address by Tom Szaky, Founder and CEO of TerraCycle. It all came together seamlessly and guests have since provided positive feedback – a true measure of success! Why do we do it? “Our goal is to produce an effective, memorable and energetic event so guests can gain a broader understanding of the Travel Reduction Program goals and be recognized for all they do,” explains Lillian Duarte, Commute Solutions Coordinator at Valley Metro. This year, 17 awards were presented to winners in categories such as Outstanding Commuter – Carpooler or Vanpooler, Outstanding Travel Reduction Program at an employer with 50-250, 251-500 and more than 500 employees, Outstanding Leadership and Corporate Sustainability at an employer with 50-499, 500-1,500 and more than 1,500 employees. Judges selected from a batch of nominations that came from coworkers, supervisors or the nominees themselves. Winners were selected based on their achievements in clean air and traffic reduction. And boy, there were impressive entries! American Express, for example, won an award for Outstanding Travel Reduction Program (TRP) at an employer with more than 500 employees – Private Employer. They pay 100% of their vanpool costs for participants! Their transportation coordinator, Danielle Taylor, works diligently to manage each of their 34 vanpools among many other facets of their program and won an award for Outstanding Transportation Coordinator, More than 500 employees – Private Employer. Click here to see all winners. Can we talk about our guest speaker for a moment? 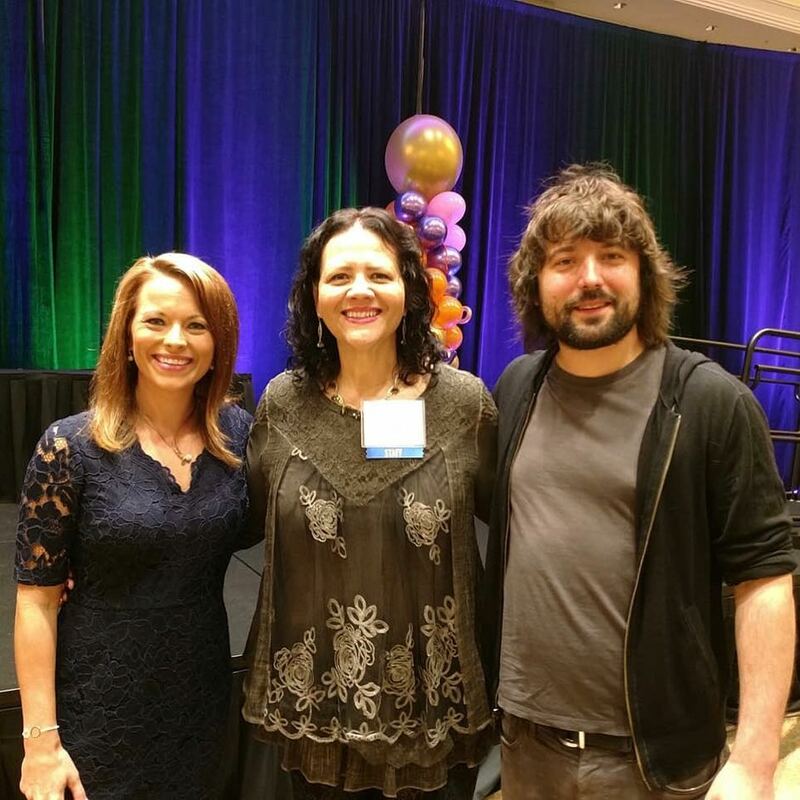 When Tom Szaky, Founder and CEO of TerraCycle spoke, I saw jaws drop. The room was silent and captivated faces were drawn to the huge screens that showed staggering statistics about waste and ocean pollution. But there were also bursts of excitement when Mr. Szaky described some of the projects that his company is working on and has produced. For example, he works with retailers to recycle flip flops into soft playground surfaces. And he works with other stores to recycle metal canisters into bicycles for children in need. His presentation was both inspiring and compelling. But those who attended all make a difference – grand and not so grand. They all add up. That is the big deal about the Clean Air Awards & Luncheon. We call all contribute to make our community and our planet, a better place to live, work and play. It may be hard to believe but it actually feels like fall in the Valley of the Sun! It’s been a while since any of us dare suggest outdoor activities and visit local destinations. But the time is here and the best part – you can take transit, carpool, bike or walk to many of them! 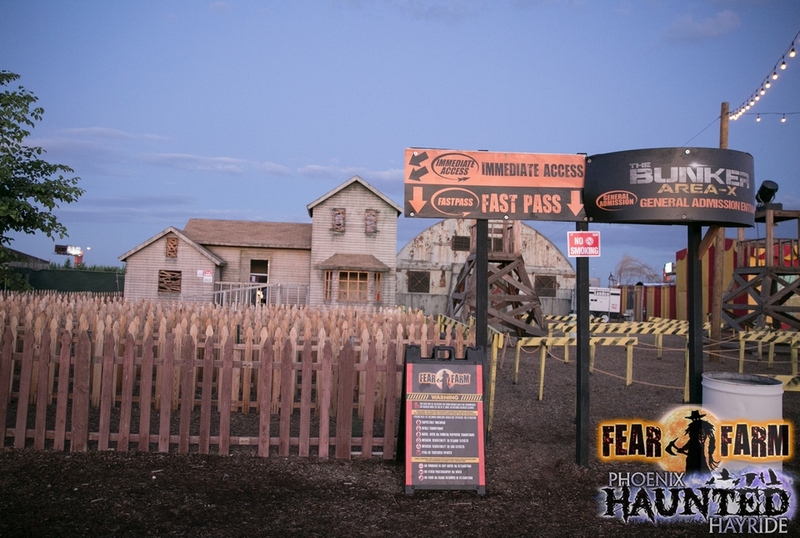 Let’s say haunted houses are one of your favorite pastimes. The Valley offers many thrilling choices and the following are accessible by transit! 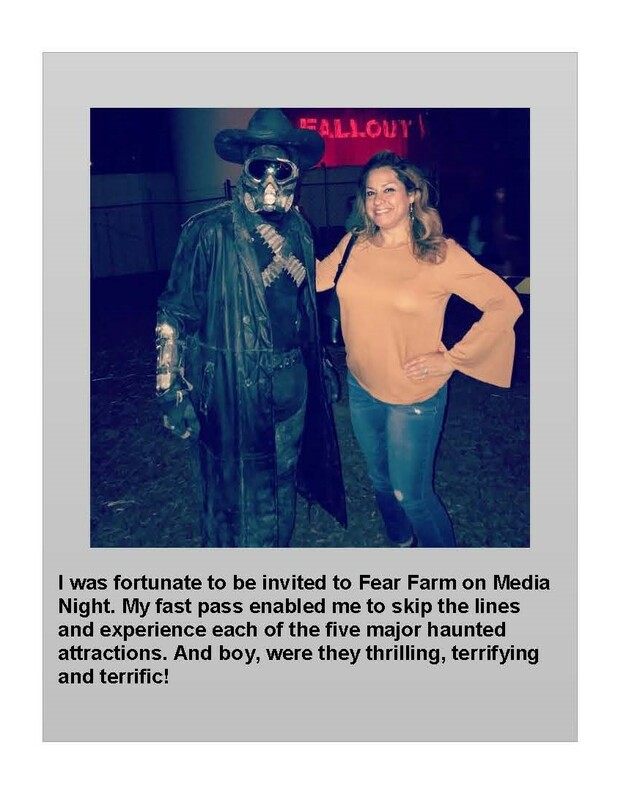 Visit our Facebook page and comment on the October 15 post that announces this blog is live and automatically be entered to win four passes to Fear Farm! Contest ends Wednesday, October 17 at 5:00 pm. Compliments of Phoenix New Times, check out the 13 Best Haunted Houses and Halloween Attractions in Phoenix and plan your trip here. Upcoming events include Strange Garden, Dia De Los Muertos Celebration and Chiles & Chocolate Festival. In addition to more than 50 varieties of plants, visitors can enjoy the serenity of walking alongside flowing streams, a 12-foot waterfall and a pond with more than 300 colorful Koi fish. 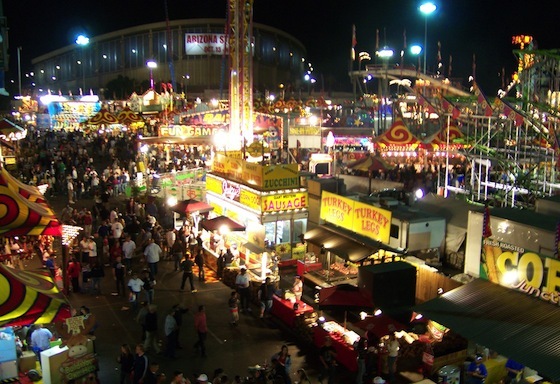 With spectacular concerts, rides and games, delectable food, enchanting animals and livestock and so much more, there is something for everyone! •	The savings are not spooky! •	No more stopping at the ghostly gas pump as often as you do when driving alone. 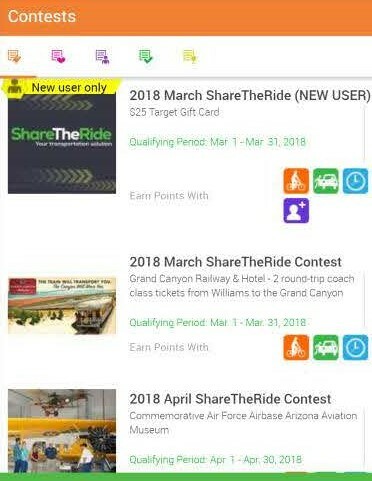 •	Winning prizes is wicked when you track trips at ShareTheRide.com. •	When you share the ride, you can coast in the HOV lane and pass those creepy crawly cars stuck in traffic. Instead, save time, money and reduce pollution, traffic congestion and stress! October 1, 2018 – WALK IT OFF! As children, we would fall. Our coaches and parents would say, “Walk it off.” Admittedly, it often worked. We got back up, dusted ourselves off and moved on. Welcome to adulthood where not much has changed. When dealing with downfalls, get back up, dust yourself off and move forward. But there are real reasons why walking – literally - helps us recover and improve. Walking improves health. Physicians recommend at least 30 minutes of activity daily. Walking to work or a transit stop can meet this goal. Walking reduces stress. Physical activity releases endorphins. Instead of a stressful drive-alone commute, feel the breeze and enjoy the trip. Walking reduces pollution compared to driving. Help everyone breathe easier by commuting with zero emissions. Eliminate the need for fossil fuels and reduce dependence on petroleum. Walking provides a new perspective. Walkers move at a slower pace than drivers, making it possible to observe and discover new places and people. Vary routes to learn more about neighborhoods. Besides the physical benefits, walking can also equal rewards! When you register at ShareTheRide.com and track walking commute trips, you can enter contests! That’s right – walking as an alternative mode is sometimes overlooked. It can also be combined with transit, carpool and vanpool for a multi-modal commute. This is a great solution for longer distances. 1. Ask your doctor. As with any new physical activity, be sure you’re up to the challenge. 2. Get in gear. Walkers need more than just the right shoes. You’ll need protection from the sun, water and maybe a backpack. a. Go online. Search Google Maps for directions. Click the walking icon, and “Get Directions”. b. Get the picture. Maps of paths and trails are available at valleymetro.org. c.	Find a friend. Visit ShareTheRide.com to find a walking route and/or partner. Registration is free. Would you like to join with other walking groups, participate in walk events, or even organize one? Walk and Bike to School events include children and adults. Feel good about setting an example for young walkers while meeting your fitness goals. Walk to School Day is Wednesday, October 10. 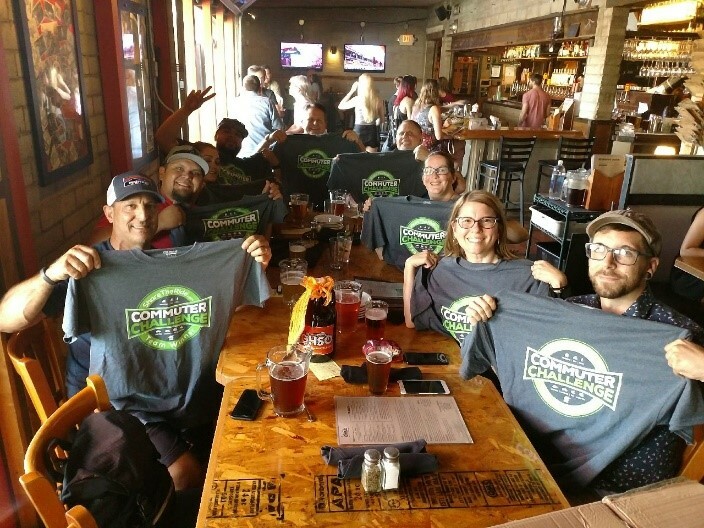 Learn more here. .
WalkPHX Wednesdays is a free social walk/run that takes place on the 2nd and 4th Wednesdays of the month and takes you on a 3.2-mile loop through Downtown Phoenix, and through three parks. Events are happening now through Wednesday, December 12. After completing your walk/run, enjoy a rotating selection of local food trucks while socializing with a great group of people who, just like you, are looking for a fun way to stay fit and be engaged in the community. Workplace programs. The Employer’s Guide on How to Start a Walking Program is a great resource for managers, Human Resources and owners to implement a simple, yet effective program for employees. You’ll learn how a walking workout plan helps employees reduce weight, lower cholesterol, increase energy, and improve brain function. Reduced healthcare costs, lower employee absenteeism rates, and a boost in employee productivity are also benefits to employers. Consider walking plus a transit trip, or walk to a nearby park-and-ride to meet a carpool or vanpool – there are many ways walking can be a viable commute solution. Valley Metro’s Commute Solutions team can help you with a walk program. Let us know how we can help . The reactions to the word “telework” range from awe-inspiring to skeptical. Here’s why: some employers and employees are thrilled with the idea of removing a commute, reducing costs for operating a vehicle and overhead, reducing pollution and traffic and contributing to a better work-life balance. On the other hand, there are employers and - while it’s hard to believe - employees who cringe at the thought because they visualize a person who is not working, lounging in pajamas and fuzzy slippers and merely collecting a paycheck. I hate to break it to you, folks, but employees present in the workplace is not a guarantee that they are working. If you are a manager and considering telework be added to your department, think about this: productivity is the measure of a successful team, not their physical location. Forbes reports in a recent article, “Boost Your Productivity Through Telecommuting”, that it can be hard to trust people to be as productive at home as they would be in a more heavily supervised office . David Kerr, CEO at Octiv, believes that the two biggest misconceptions around a mobile workforce are communication and accountability. If you have measurable key performance indicators in place tied to your overall goals, you can more easily measure productivity and performance. For many businesses, the benefits are well worth the risks, especially due to the recruiting advantage. What about connectivity? Technology, software, hardware and social media all contribute to bringing, and keeping, the team together. In fact, many managers will attest that their team members are located in multiple cities and meetings are possible with video conferencing and online meetings plus shared drives and databases. 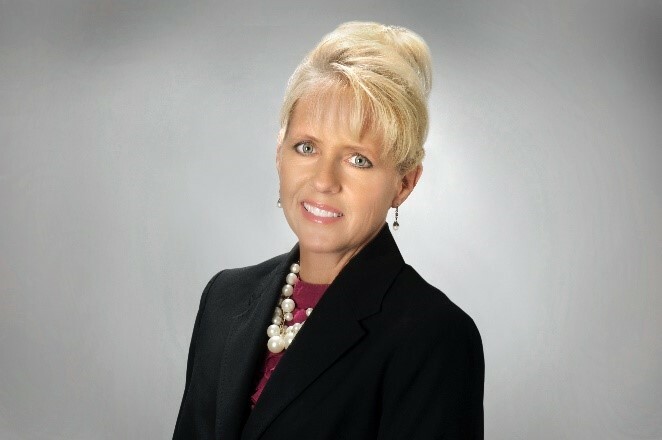 We met with a Phoenix teleworker, Lori H., Professional Lines Underwriter at Chubb and Sons. “I have telecommuted a day or two per week for the past five years or so, removing a trip each way that is approximately 25 miles,” Lori smiles. The benefits Lori enjoys include helping the air quality and saving money. September 3, 2018 – OCTOBER IS RIDESHARE MONTH! 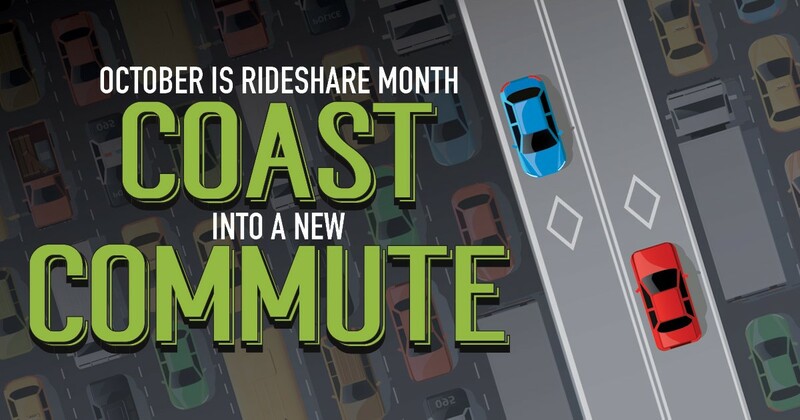 So you may have heard and seen by now that October is Rideshare Month. It’s a time for Valley residents to abandon the drive-alone commute and instead, try transit, carpooling, vanpooling, biking, walking and teleworking. Large employers will typically inform their employees and driving-age students how to get involved because it is part of their Travel Reduction Program and commitment to cleaner air. But what if you are not among those who receive this news? Read on! Begin by taking the pledge now through September 30 to use an alternative mode during Rideshare Month. It’s easy and you will be entered to win one of two $50 Fox Restaurant Concepts gift cards! Next, make good on that pledge and use an alternative mode(s) during October as often as you can. Track each trip made for the work commute in your ShareTheRide.com calendar to earn points and enter contests for…you guessed it, more great prizes! There is also a Commuter Challenge, a New User contest and more! Winning prizes for your efforts is awesome. But those who participate already win because they save money, reduce pollution and traffic congestion, prevent vehicle wear, get to work quicker and much more. You’ve got nothing to lose except stress and a huge gas bill! August 20, 2018 – VANPOOL PROGRAM MAY BE A PERFECT FIT! Imagine this. It’s time to leave for work and you get in your car and drive a short distance (or bike or walk) to a nearby Park-and-Ride lot. You park in a secure covered space and get into an air-conditioned, safe and roomy van with five to 14 other commuters. You’ve become friends with your fellow passengers, so the ride to work is enjoyable. You may discuss the news, weather, sports or how your kids are doing in school. Or you may be relaxing with the seat reclined and listening to music with headphones. Meanwhile, a fellow vanpooler is safely driving your group to work, maybe stopping once or twice to pick up other passengers. You are coasting along in the HOV lane past traffic and arrive safely to work. You say goodbye to your friends until you rejoin for the return ride. Ladies and gentlemen, this is a vanpool. Participants share the cost of the lease and fuel. Based on the total distance driven and the number of participants, these folks can save a significant amount of money, gas, time and vehicle wear. On average, each person spends about $25 per week. Sounds pretty good if you typically travel 20 miles or more each way! Take Rosendin Electric, for example. They launched their first vanpool in July with nine workers who share a commute from the Goodyear Park-and-Ride to Intel’s Ocotillo Campus in Chandler – almost 90 miles roundtrip! Rosendin workers meet at 4:00 a.m. each weekday with their hard hats, safety equipment and reflective vests needed on the job site. Workers rotate driving duty with each trip, giving their co-workers time to talk, sleep or catch up on email. In the past two months, Rosendin Electric has started four vanpools with nearly 40 employees participating in the program! So where do you begin if you’re interested? Valley Metro offers resources like brochures, a recorded webinar, Lunch and Learn presentations to Valley employers and more. Contact Commute Solutions at 602.262.7433 or vanpool@valleymetro.org. And now is the perfect time to begin – new vanpools get one month free! Offer expires August 31, 2018 – see flyer below. August 6, 2018 – IT’S BACK TO SCHOOL TIME! It may still be in the triple digits outside and our minds are on vacation, but many Valley schools are now back in session! Parents, students, teachers and commuters are all affected. Streets are filled with pedestrians, traffic is more congested and calendars fill up with before and after school activities. Let’s take a look at a few ways to ease into the routine. •	Stop, look and listen around light rail tracks and bus stops. •	When crossing streets, always look both ways and cross only at crosswalks. 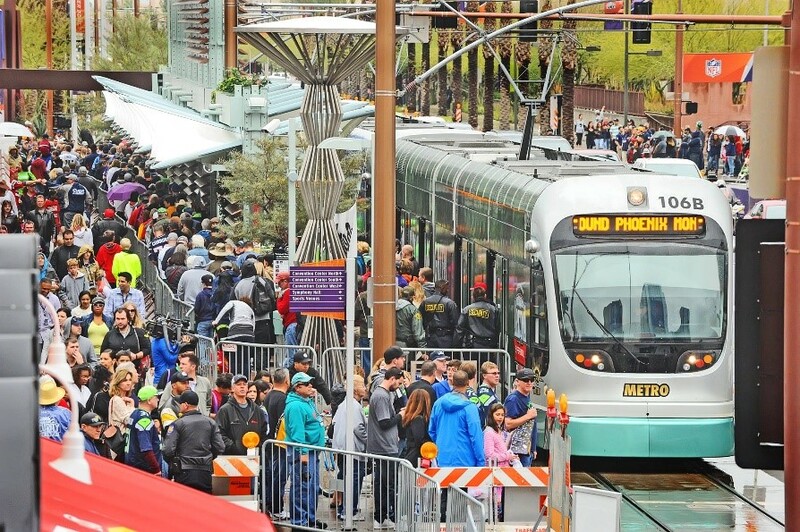 •	Never try to outrun a light rail train or bus – it’s dangerous and not worth the risk to save a few minutes. •	Always be extra cautious when driving around transit and in school zones. ASU students can purchase the U-pass for the upcoming academic school year for $150, which is a $50 savings compared to last year. 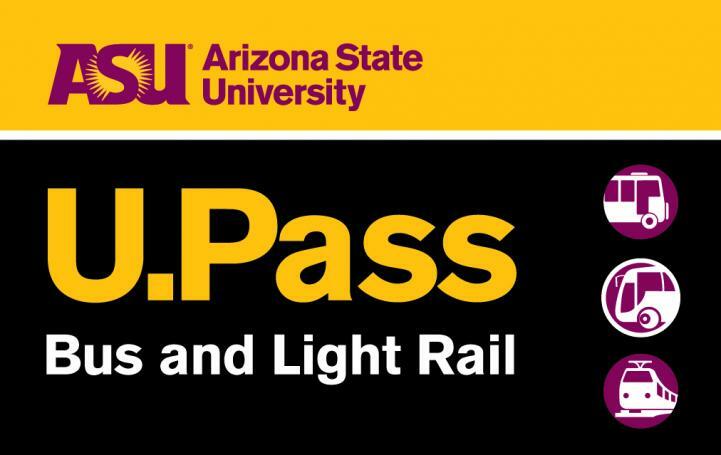 The ASU U-Pass is for unlimited rides on bus and rail for the entire school year (August 13, 2018 through May 12, 2019). That’s about 55 cents a day! 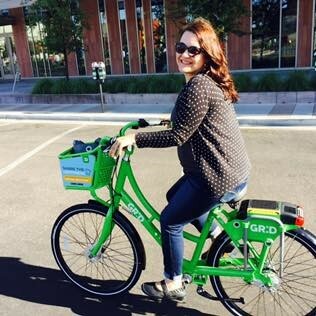 GRiD Bike Share offers students a 6-month pass for $25! Bike share opens up mobility options and makes public transit more viable. It also enables greater access to multi-modal trips where you may use bike share for the first part of your trip, but may take light rail, a car service or even catch a ride with a friend on the way home. Driving-age students and non-students can register for free at ShareTheRide.com and search for a carpool partner. Even if your schedule changes, you can modify your profile and/or carpool only on the days when your schedule is consistent. By carpooling, you’ll save on gas, wear and tear on your vehicle, reduce pollution and traffic congestion and get to school faster by riding in the HOV lane – even if you’re not looking forward to the school day! ShareTheRide.com and its mobile app also provide trip-planning features, a commuting cost calculator, contests for participants with amazing prizes and much more! Check out all online tools and use the ones that suit your commute! We wish all students, parents, teachers and commuters a safe school year! Be sure to stay social and follow us on Facebook for more tips, contests and inspiration! Riding the bus and light rail may seem easy. But for some, it can be a challenge. Passengers may be new to the transit system, may not be English-proficient, or may have disabilities that add difficulty. In fact, surveys and studies show that the inability to access transportation is the biggest barrier to education, employment, health care and other essential services for people with disabilities. 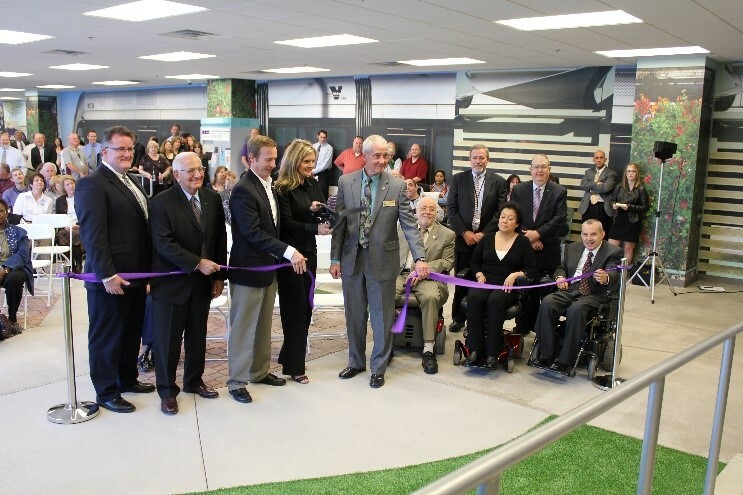 But Valley Metro’s Mobility Center is enhancing the lives of thousands of people with disabilities each year by providing them with the skills and services they need to get out and about. with disabilities who need help navigating routes. 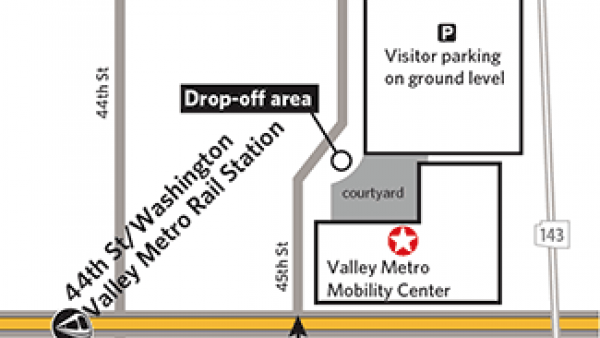 Opened in 2010, the Valley Metro Mobility Center offers programs and services to connect seniors and people with disabilities with Valley Metro bus, light rail and paratransit/Dial-a-Ride services. Those with disabilities can receive free one-on-one training to use public transit, and qualified seniors and people with disabilities can obtain eligibility for the Reduced Fare Program. 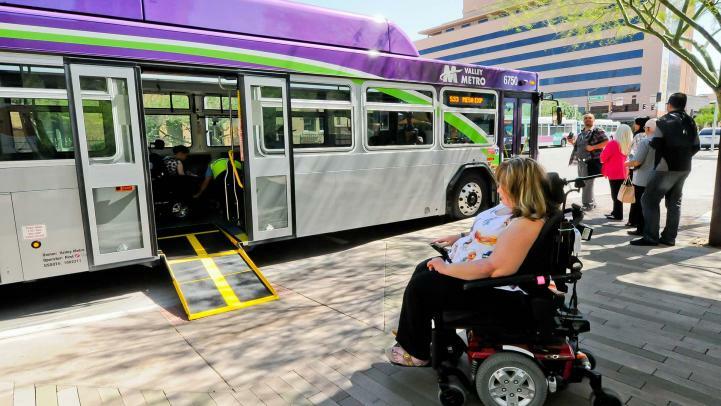 If a customer is unable to use conventional bus and light rail service, she can apply for paratransit, Dial-a-Ride and other discounted transportation programs. The Mobility Center is conveniently located at 4600 E. Washington in Phoenix and accessible by light rail, local bus, Phoenix Dial-a-Ride and Valley Metro Paratransit. The Mobility Center opened in 2010. There is also travel assistance for those who do not qualify for these services. 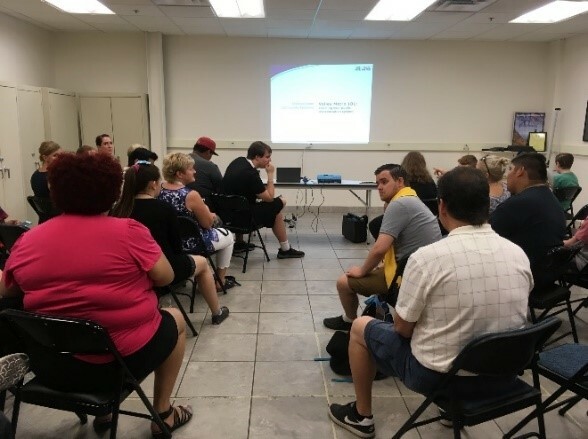 Valley Metro partners with Ability 360 Center in Phoenix, where they provide training for the general public each month. Attendees will learn how to take bus and light rail and the class is free! For more information, contact David Carey at 602.443.0723 or DavidC@ability360.org. Whether you are considering purchasing a different vehicle or not, alternative fuel vehicles (AFVs) have become more appealing because of fuel efficiency, cleaner emissions and for some, the benefit of riding in the HOV (high occupancy vehicle) lane. But not all AFVs are created equal. Maricopa County Travel Reduction Program (TRP) encourages the use of AFVs, however, AFV drivers who commute alone still contribute to traffic congestion and should not qualify for incentives equal to those who carpool, vanpool, ride transit, bike and walk. 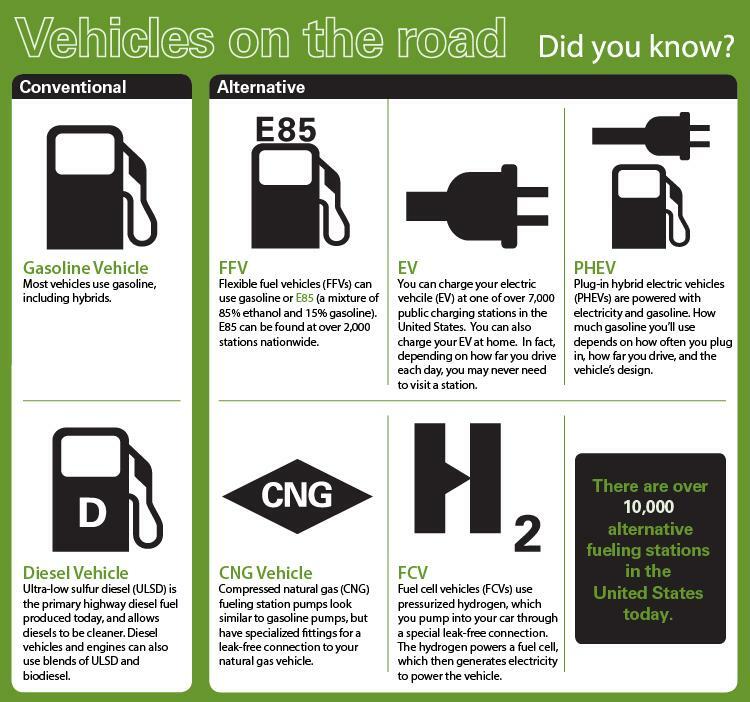 Valley Metro developed a flyer to explain the role of AFVs in the TRP. In a similar way, participants who log alternative mode activity at ShareTheRide.com will find that the point value for driving AFVs is less than trips made with other alternative modes, such as transit, carpool, and biking. Whether you’re interested in a BMW, Ford or Tesla, many auto makers now offer an all-electric option. Vehicles range in size from two-seat city runners to full-size luxury sedans and SUVs. 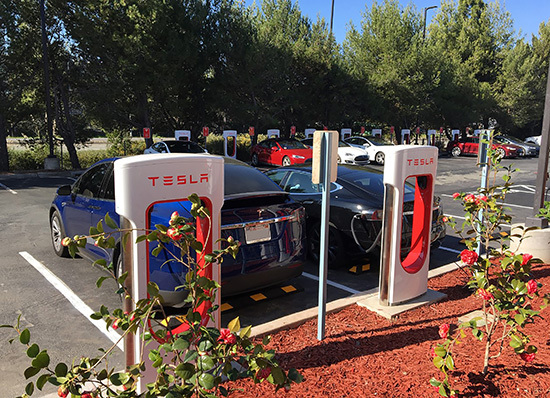 More than 1 million electric cars are projected to be sold by 2020, and by 2030, it’s estimated that one in four new cars sold will be electric. Although the federal and state governments help with credits and rebates, be prepared to pay more than traditional vehicles because they simply cost more to produce. Learn about performance, safety, features, charging time and more here. Making an informed decision, comparing pros and cons and taking advantage of offers are among the best ways to approach making a change over to an AFV. Clean Cities is also a great resource, with local representatives who can provide expert advice. 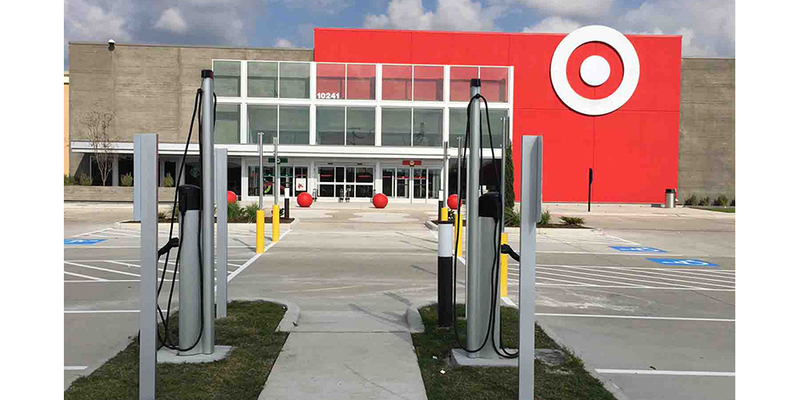 Target stores are charging up their Electric Vehicle Program to reach more than 20 states. 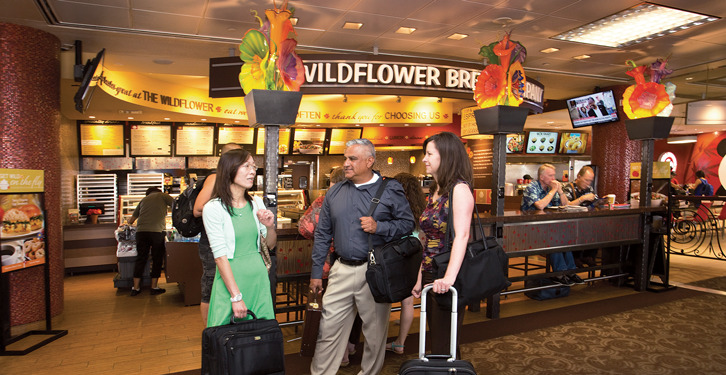 If you have plans to travel a long distance, chances are good that you need to get familiar with Sky Harbor International Airport in Phoenix. Make the task less daunting and get familiar with Valley Metro Bus and Rail and PHX Sky Train to get there! Avoid traffic, reduce pollution and skip paying parking fees when you ride transit to get to the airport! Bus routes 1 and 44, as well as any of the 41 light rail stops, will take passengers to the 44th St/Washington light rail station. 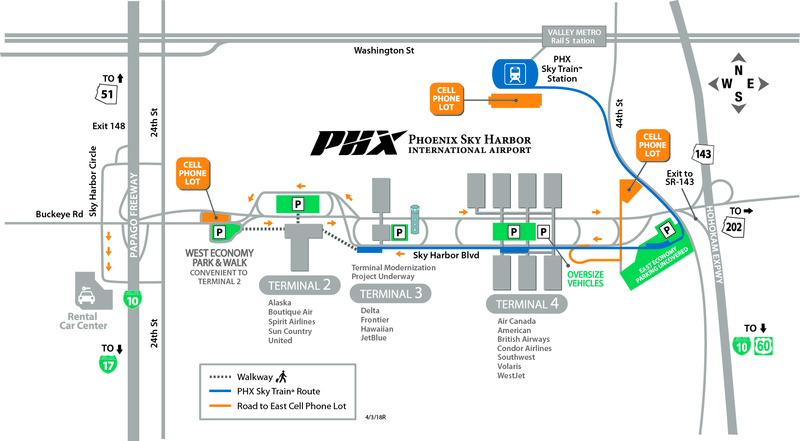 You can connect to PHX Sky Train, a free shuttle that circulates to each terminal and East Economy parking. 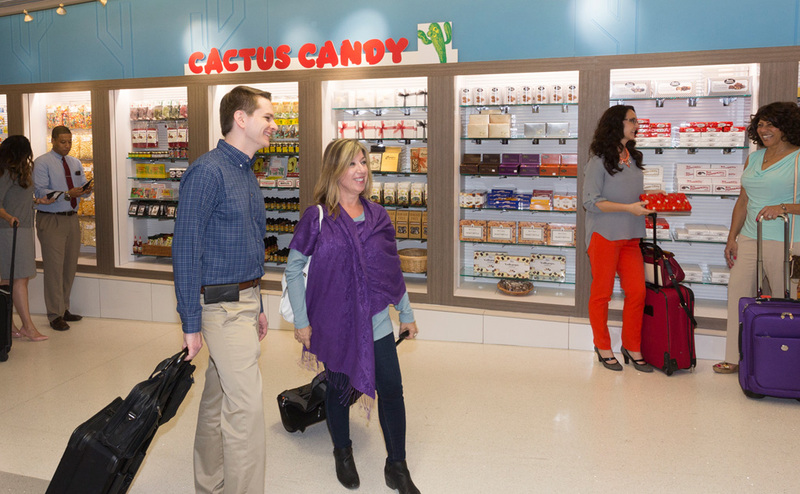 For locals who are not planning to depart the Valley of the Sun, there are plenty of fabulous shops and eateries at the airport . 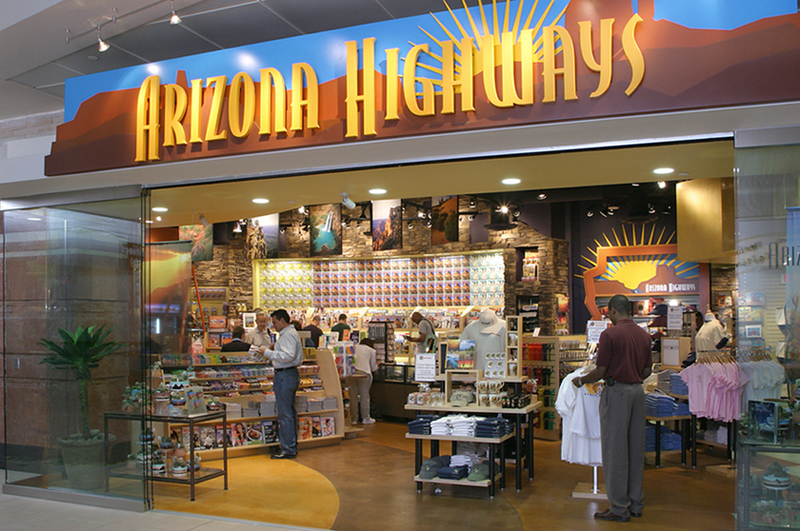 Among them are Arizona Highways, Bunky Boutique and Cactus Candy, which carry gifts that reflect the spirit and taste of the Southwest. Check out Barrio Café for unique Mexican American cuisine, Humble Pie for scratch-made pizza with mouthwatering crust, or Wildflower Bread Company for delicious comfort food that starts with Artisan bread! You can win five 1-Day Local passes during June when you track alternative mode trips! Details are here. 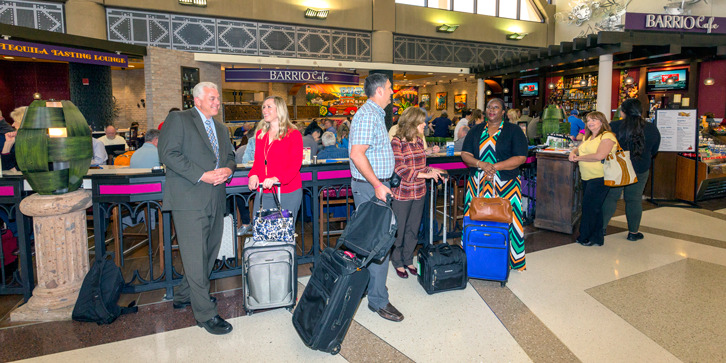 Whether you travel short or long distances, add a little adventure and make a stop at Sky Harbor International Airport airport with ease. Safe travels, all! June 4, 2018 – WHAT IS SUMMER OZONE? We’ve all seen and heard the warning signs: A high pollution advisory, or HPA, is in effect. You may think, “OK, it’s extra dusty and I should probably stay indoors.” But what’s really happening around us and how bad is it? Glad you asked! 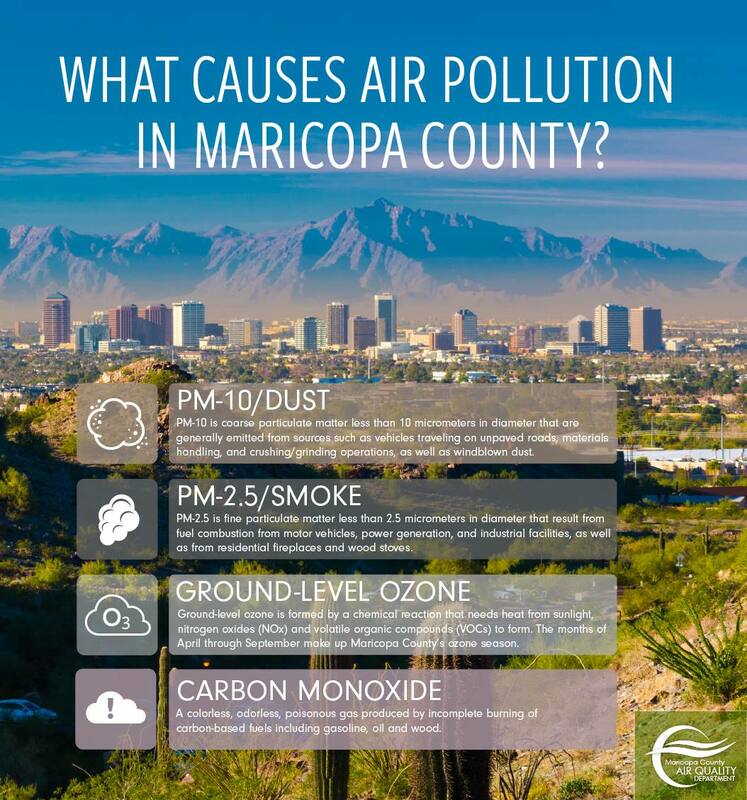 Valley Metro partners with the Maricopa County Air Quality Department (MCAQD) to inform Valley residents and employees about air quality and pollution prevention. Ground-level ozone is the most widespread air quality problem in the US, thriving on sunny days and high temperatures. It is formed when sunlight combines with volatile organic compounds (VOCs) and nitrogen oxides (NOx). It’s also harmful and should not be confused with the “good” ozone in the upper atmosphere. In case you’re wondering, there are other types of pollution, such as carbon monoxide and particulate pollution (PM-10 and PM-2.5), dominant during winter months. 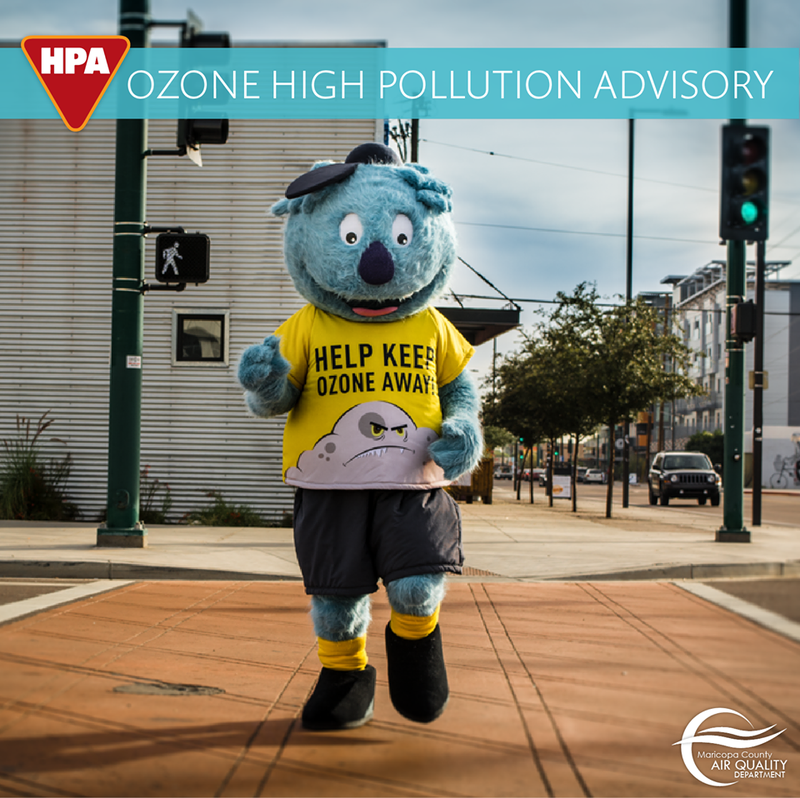 An HPA is issued when the highest concentration of pollution may exceed the federal health standard. Everyone, especially people with lung disease, such as asthma, should reduce prolonged or heavy outdoor exertion. What can you do to prevent pollution? 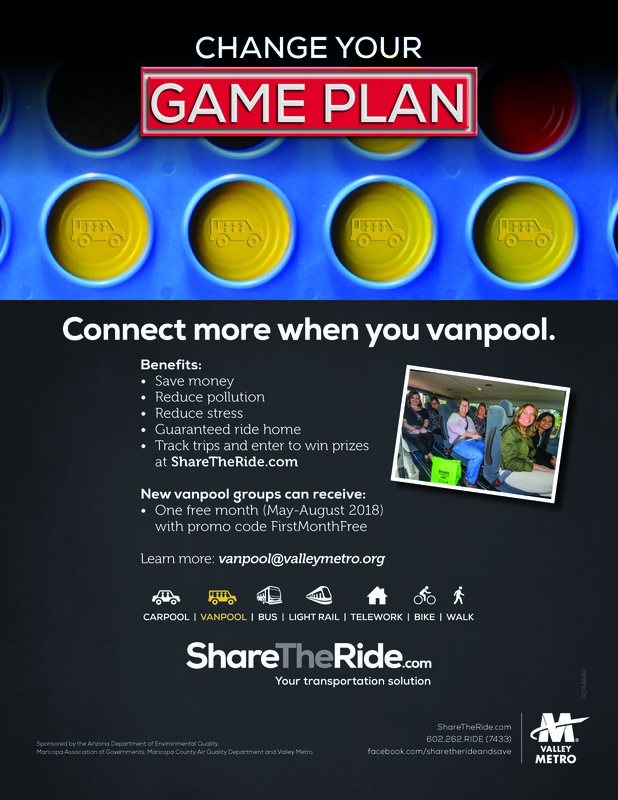 You can also register for free, create a profile and search for a vanpool or carpool right here at ShareTheRide.com; sign up for email and text alerts for HPAs and clean air updates; and download the Clean Air Make More App to receive real-time air quality information with the ability to report an air quality problem. Together, we all can make small changes that add up to a big impact during summer. Do your part, encourage others, and let’s breathe easier. MCAQD mascot, Gus T. Breeze, getting the word out about ozone to the community. May 21, 2018 – SUMMER’S ALMOST HERE - CHECK OUT DESTINATIONS THAT ARE NEAR! Valley students are cheering because the end of the school year is near and that means summer fun follows! This may or may not mean that parents are cheering but we can all agree that summer is approaching and we want to have some fun! While many of us dream of basking in the sun on an island far away, or cruising on a ship to a tropical oasis, the reality is that we all can’t make those dreams come true. But, that doesn’t mean summer can’t be fun, educational, safe and accessible! Valley Metro has developed a Destinations Guide to share local places to visit. These venues are family-friendly, affordable and accessible by transit! Looking to make a splash? Big Surf, Enchantment Island Amusement Park and Golfland Sunsplash have you covered. Interested in exploring nature? Desert Botanical Garden offers a 140-acre garden and five unique trails to explore and enjoy the beauty of the Sonoran Desert; the Japanese Friendship Garden boasts 3.5 acres with a tea garden, tea house, more than 50 varieties of plants and a Koi pond with over 300 colorful Koi fish. Those looking for arts and culture will find it easy to get to ASU Gammage for a play, Comerica Theater for a concert, and the Musical Instrument Museum to view more than 6,800 instruments on display from around the world and enjoy live entertainment! We can’t leave out our shoppers! Get to malls by bus and light rail, such as Arrowhead Towne Center, Chandler Fashion Center; and visit Westgate Entertainment District for more shopping plus sporting events! 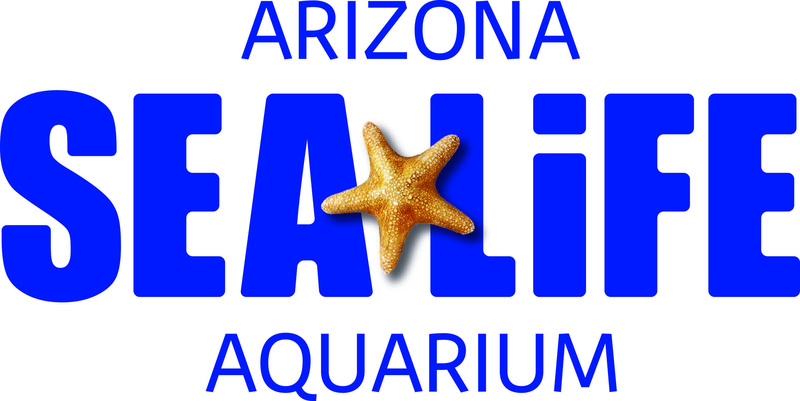 And now for the really exciting part – Tell us your favorite activity to do during summer by emailing cschneider@valleymetro.org for a chance to win two free passes to either SEA LIFE Arizona Aquarium , where winners will experience amazing exhibits and sea life creatures; or LEGOLAND Discovery Center Arizona, where winners will see fascinating attractions, including Merlin’s Apprentice Ride and Dino Explorer. 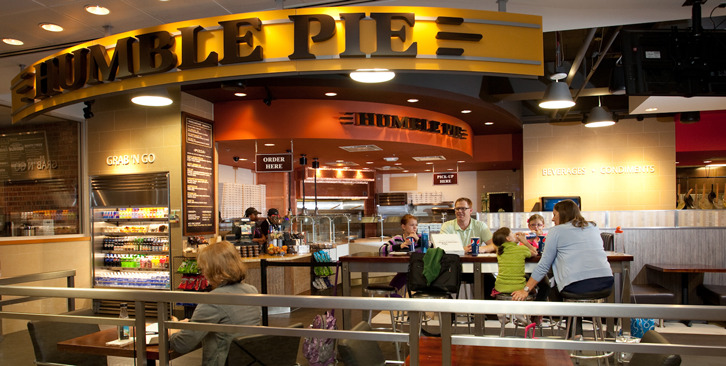 Both venues are accessible by transit and are located inside Arizona Mills Mall. Winners will be randomly selected and contest ends on Thursday, May 31 at 5:00 pm. Remember to check out the Destinations Guide – there is something for everyone! Have a safe and fun summer, too! May 7, 2018 – WHAT IS THE TRAVEL REDUCTION PROGRAM (TRP)? Employers and schools in Maricopa County with 50 or more full time employees and driving age students, at one or more site, must participate in the Maricopa County Travel Reduction Program (TRP). The goals include reducing air pollution and traffic congestion. Specifically, employers and schools are asked to reduce single occupant vehicle (SOV) trips and/or miles traveled to the work site by 10 percent for a total of five years, followed by five percent for three additional years, or until a 60 percent rate of SOV travel is reached. That’s the program in a nutshell and to some, might seem like a burden. But step back and take a look at the big picture and you’ll see how the program benefits Valley residents and commuters. It equates to cleaner air, smoother commutes, savings, less stress and more. TRP employers and schools are required to offer incentives that will encourage change in their employees’ commute behavior. For example, those who carpool may be rewarded with covered parking close to the entrance. Why does this matter? Parking close to the entrance, especially when temperatures soar, can mean a much more pleasant trek. When two or more driving-age people share the ride to work, they can use the HOV (high occupancy vehicle) lane, save money and time, lessen vehicle wear and arrive less stressed than driving alone. Prize drawings are another popular incentive and typically include a gift card worth $25 or more that participants who use alternative modes can enter to win. Imagine taking the bus or light rail and saving on commute costs plus you have the chance to win a gift card to Amazon or Starbucks. 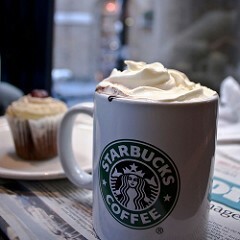 That’ll perk you up! Incentives, to reduce drive-alone travel, range from prize drawings and transit subsidies to onsite showers and daycare. While it is up to each employer to choose incentives that will best influence change, employees have the chance to express the most desirable incentives during the annual survey. Check with your Human Resources department if your employer is a participant in the TRP. Employers are required to inform new hires so you may have a notice in your new hire packet that’s just waiting for you to set eyes on. If your employer has fewer than 50 full time employees, they may participate on a volunteer basis by contacting Maricopa County Travel Reduction Department at 602-506-6750. Valley Metro’s Commute Solutions team is available to help answer questions, provide training and other support for a successful program. Valley Bike Month is going strong, but will you continue to ride when April ends? We sure hope so and there are resources to help. Find a bike shop to obtain a bike or make repairs to your own; find a bike buddy at ShareTheRide.com , or check out Grid Bikes – a network of stations where bikes are publicly available for short-term rental. 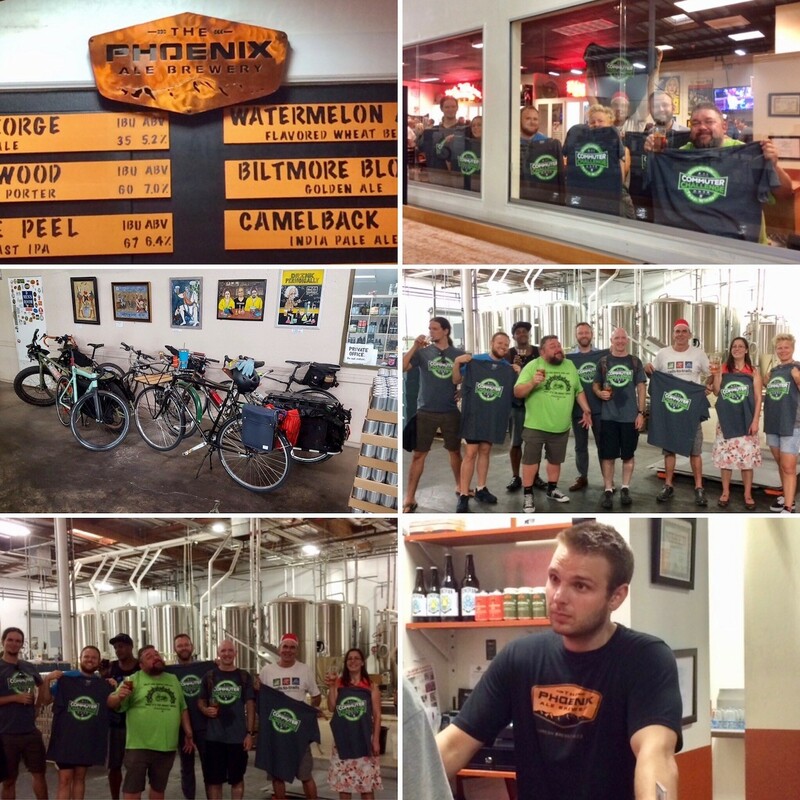 Maybe you’ve you seen the bright green bikes in motion or at racks in Mesa, Phoenix and Tempe. Grid Bikes launched in 2013 and has grown because people tried it, liked it and ultimately, signed up for it! I met with Lisa Parks, Community Outreach Manager at Grid Bikes to learn more. Lisa addressed community involvement, “We've also launched a Grid For All equity program to reach the underserved with $5 annual memberships. So far, we've partnered with the City of Phoenix Housing Department in the Edison-Eastlake neighborhood as part of a Choice Neighborhoods grant from Aetna. And we've also partnered with the City of Mesa to offer low-income residents this membership. 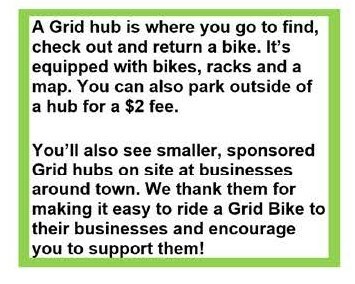 In addition, we offer deeply discounted group memberships, which many people don't know about.” These initiatives shed light on the many reasons Grid Bikes has grown and serves a diverse audience. What’s next for Grid? Lisa shares, “Of course, we're always looking to expand and install new stations. Bike share is constantly evolving so we're excited to see what happens next!” Now through May 31, new users may use promo code GRID00317 for a free 7-Day Pass! By now, you have likely heard about ShareTheRide. I mean, you’re here, right? Something must have lured you. Was it the free registration and nearly 40,000 participants who create a greater chance to find a commute partner? Maybe the New User and Monthly contests with great prizes caught your eye? How about the Team Challenge currently underway with teams of bicyclists competing for a victory party and limited edition t-shirts? 3. Enter First Name and Last Name as prompted. 4. Create your User ID (use your work email address) and Password. 5. Read and accept the Terms and Conditions of Use and Privacy Statement. 6. When the Account Created box appears, click OK to continue. 7. On the next screen, complete the Personal Information. (This information is confidential and cannot be viewed by others on this site.) Click Next when done. 8. Create your first trip profile. Enter the Trip Name and origin and destination addresses. Select Trip Visibility if you want to be available for matches with others. Enter your work schedule and mode of travel. Click Save to continue. 9. A confirmation email will be sent to you with a link. Click on the link to activate your account and use the system. 10. Log on to your account and go to Find Commuting Partners. Then select Carpool, Bike, Walk or Bus. 11. Click My Trip Tracker, My Commute Calendar to log commute trips and earn prize points. 12. To enter contests, click Enter Contests on the Commute Calendar page. Once registered, you’ll be able to create a profile with a unique route(s) to work, schedules and the ability to make yourself visible to others for carpool matching. You’ll be able to search for a vanpool with an available seat, calculate your cost savings and greenhouse gases prevented, track alternative mode trips in your personal calendar, enter contests and much more. We also offer Custom Subsites for transportation coordinators at large employers in Maricopa County to comply with the Travel Reduction Program (TRP). Here’s what one ShareTheRide user, Maria who works at U.S. Foods in Tempe has to say: "I've been using ShareTheRide.com for nearly 11 years! I registered when I was with my old company and matched with a carpool partner who worked elsewhere; and now I carpool with a coworker," Maria explains. "My favorite things about ShareTheRide include it's extremely easy to use, I have no problem tracking trips, I save money because I no longer drive and my partner and I split the costs, and finally, I have built friendships!" Maria began using the site because of medical reasons and although she is able to drive, she chooses not to and instead, enjoys the ride and many benefits. Let us know how your experience is using ShareTheRide.com by choosing “Contact Us” at the bottom of the home page. March 19, 2018 – VALLEY BIKE MONTH IS AROUND THE CORNER! You may have heard - Valley Bike Month occurs in April each year. So what’s all the buzz about? First, the weather in the Valley is perfect! It’s easy to get outdoors and stay outdoors with a light breeze and plenty of sunshine. Next, those who bike can take advantage of events in multiple cities, team up for a challenge and enter contests to win prizes. In a nutshell, it’s the perfect time to explore biking and its benefits. 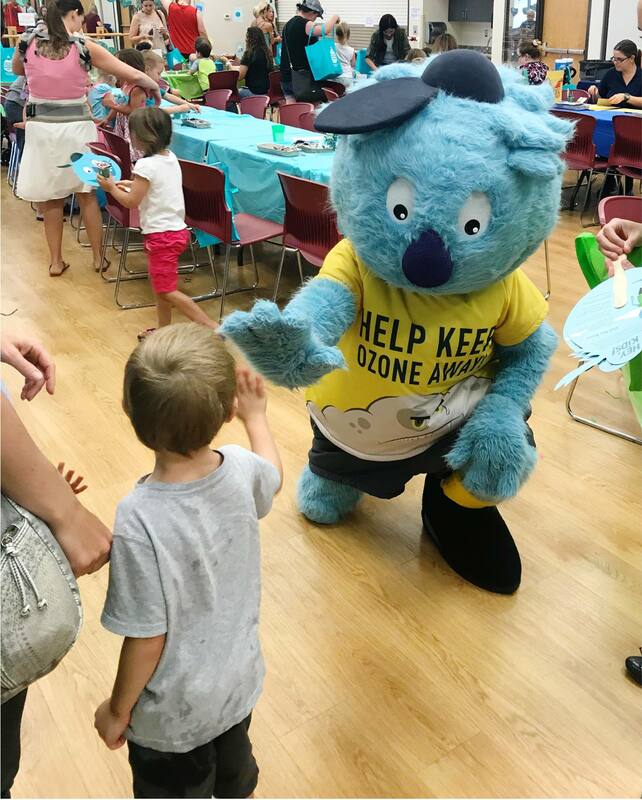 No matter where you reside, there is likely a family-friendly event near you . For example, you can enjoy the El Mirage Bunny Hop Bicycle Rodeo, Chandler Family Bike Ride and Cycle the Arts Downtown Family Friendly Ride. How does Upcycled Crafts Night at Rusty Spoke or Phoenix Spokes People/FilmBar Bike-in Movie sound? Y'all, these are more than just bike rides – they are events that connect you to community while getting exercise and reducing pollution! Wondering how to make biking work for your work commute? You can take your bike on the bus and light rail to extend a transit trip. 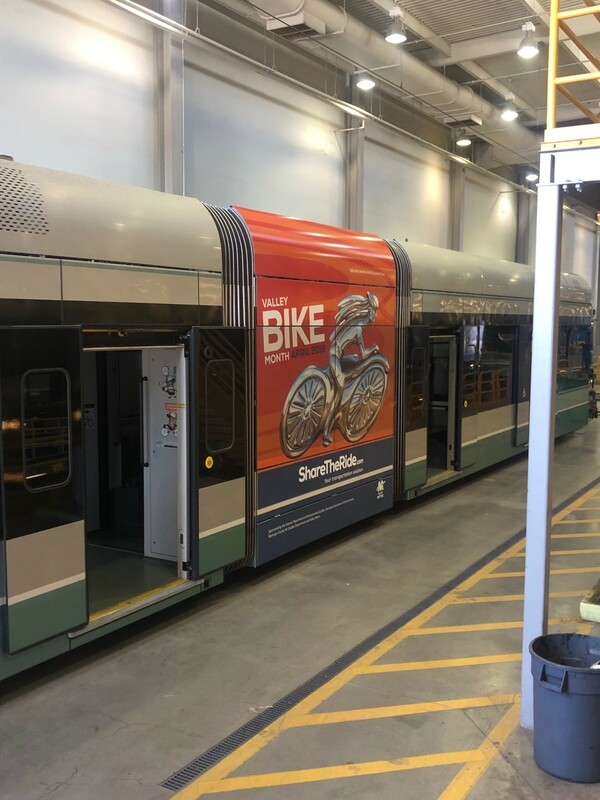 Valley Metro buses accommodate 2 – 3 bikes each and bikes can be hung on the light rail racks inside each train or riders may stand beside the bike away from the doors. We have a flyer to teach you how. Need another reason to participate? 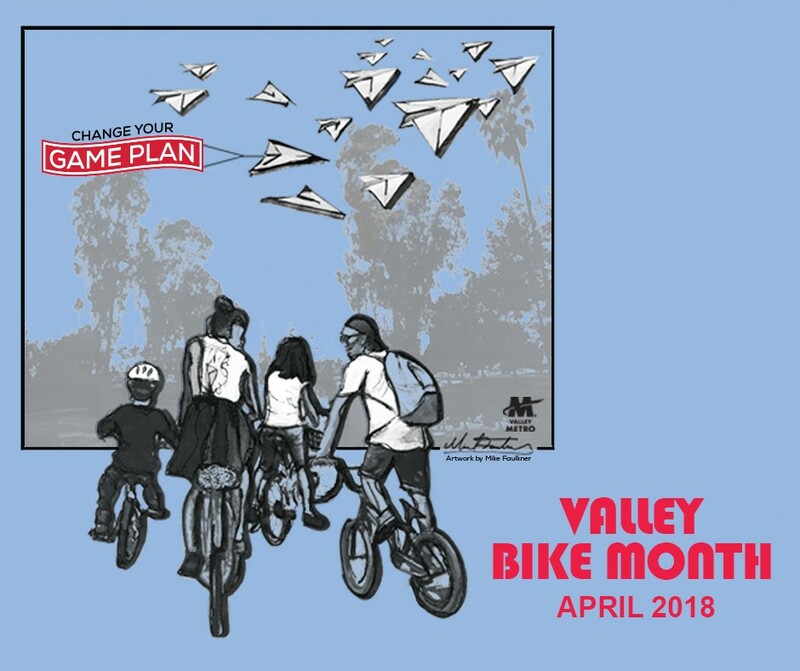 Email cschneider@valleymetro.org and tell us what you like about biking and you will be entered to win a Valley Bike Month 2018 t-shirt! Deadline to submit is Friday, March 23 – winner will be announced on our Facebook page on Monday, March 26. Good luck and happy riding! Although the rewards are high, planning a trip using transit, biking, walking or ridesharing can take some effort. There are bus routes and schedules to consider, maps to read and carpool matches to contact. Do you ever wonder where to start? NextRide - an electronic service that provides next bus and train schedule information. All you need is a phone or access to the internet, your route number and your STOP# (located at every bus stop and light rail station). eSchedule - allows you to view point-to-point stop times. eTransit Book - enables you to select only the routes you want and print. It’s lightweight and less waste than a Transit Book. 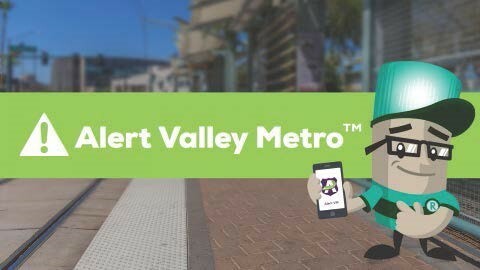 ShareTheRide.com - Valley Metro’s free online multimodal trip matching system that provides cost savings information, contests to reward participants and much more! February 19, 2018 – NEXT UP : SPRING TRAINING! It may seem like we were just decorating the Christmas tree, wrapping presents and celebrating the holidays with family and friends when suddenly, we are feeling sunshine and planning to attend Spring Training! Enjoy the games and leave the driving to Valley Metro. Did you know that most stadiums are accessible by taking Valley Metro Bus, Rural Connector, Neighborhood Circulators and Trollies? Check out Cactus League’s Spring Training schedule here, as well as Valley Metro’s routes at here. Whether you’re traveling from Ajo/Gila Bend to Goodyear Stadium via Route 385, or to Hohokam Stadium in Mesa via Route 112 – Country Club/Arizona Ave., Route 120 – Mesa Dr. or Mesa Downtown Buzz, Valley Metro will provide an affordable, safe and environmentally-friendly way to get there! New this year: six Cactus League parks will have extended backstop netting along the dugouts - Hohokam Stadium, Goodyear Ballpark, Scottsdale Stadium, Maryvale Baseball Park, Tempe Diablo Stadium and Surprise Stadium, and the rest of the league is expected to follow suit next year. This follows a trend in MLB ballparks; it drew national attention after a little girl was seriously injured by a line drive in the seats behind the dugout at Yankee Stadium last summer. Mr. Meyer adds, “Another highlight of the Cactus League is the accessibility of the players. Spring training has a relaxed vibe. Each of the Cactus League ballparks has unique features, and I urge fans to check the schedules to learn about special promotions throughout the season." Fans will be in good company: Arizona’s 15 Cactus League clubs drew a record 1,941,347 fans in 2017! Enjoy Spring Training and let Valley Metro take you out to the ballgame! There are many benefits to using transit, carpooling, vanpooling, biking, walking and teleworking instead of driving alone. For example, reducing pollution is possible when sharing the ride and taking cars off the road. For example, 83.5 miles driven equals a pound of pollution. Saving money is also a significant benefit – commuters spend less on gas, vehicle maintenance and sometimes auto insurance discounts apply. Take it from Willie H, a bus rider who won a 2017 Clean Air Campaign Award for Outstanding Commuter – Transit Rider. Willie’s commute to work at SRP is 30 miles each way and he has been taking the Express bus for four years! 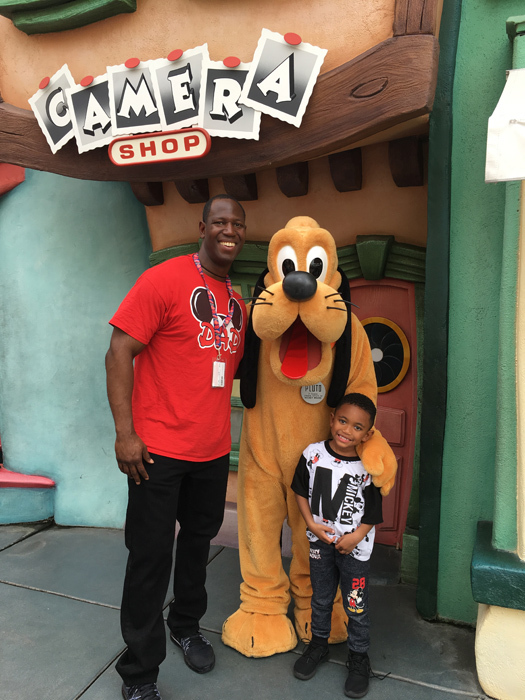 “With the money I have saved, I recently took a trip to Disneyland. My family and I got to vacation and enjoy many laughs instead of putting that money toward gas,” Willie recalls. ShareTheRide.com offers a Commuting Cost Calculator to track commute savings and annual greenhouse emissions. Track trips to keep New Year’s resolutions of saving money and reducing pollution in check! Aside from saving money, Willie trades in the traffic jam for jamming out to his favorite tunes, reading, emailing or resting while Valley Metro is behind the wheel. Check out all your transportation solutions at ShareTheRide.com. Explore your options and start saving money, and reduce stress, pollution and traffic congestion.